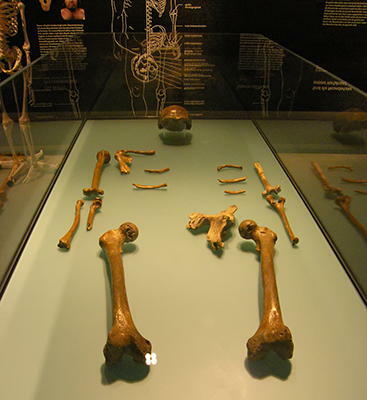 The original Neanderthal skeleton from the Neander Valley, the type specimen, dubbed Neanderthal 1, consisted of a skull cap, two femora, three bones from the right arm, two from the left arm, part of the left ilium, fragments of a scapula, and ribs. 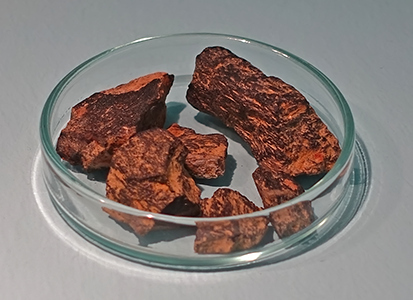 The workers who recovered this material originally thought it to be the remains of a bear. They gave the material to amateur naturalist Johann Carl Fuhlrott, who turned the fossils over to anatomist Hermann Schaaffhausen. The discovery was jointly announced in 1857. 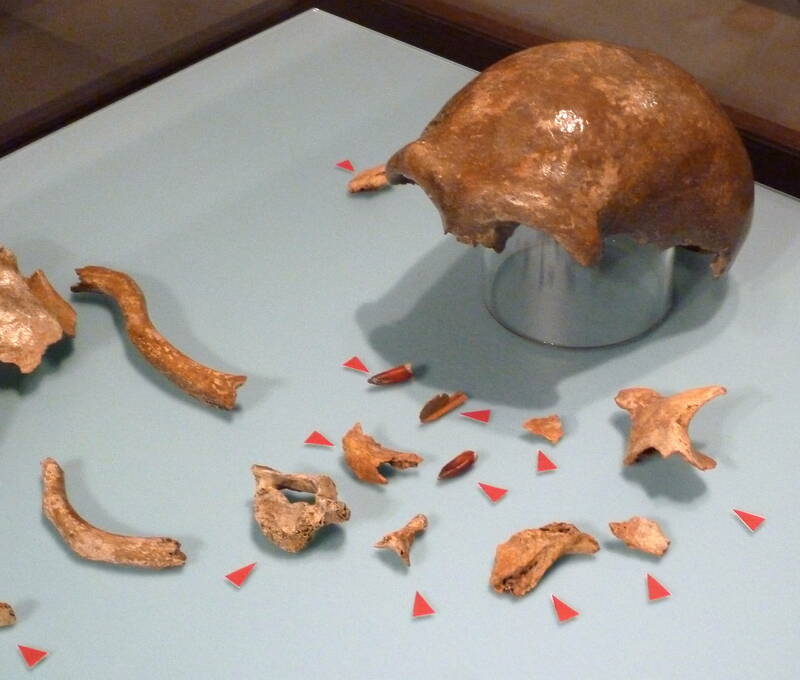 The original Neanderthal discovery is now considered the beginning of paleoanthropology. These and other discoveries led to the idea these remains were from ancient Europeans who had played an important role in modern human origins. 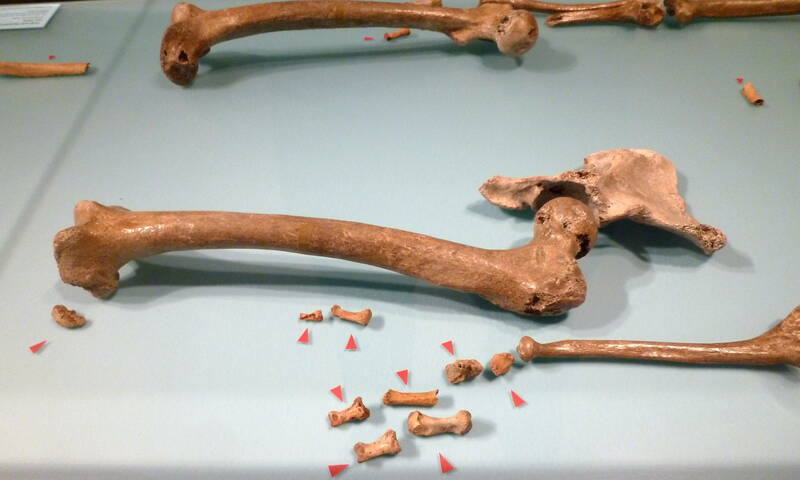 The bones of over 400 Neanderthals have been found since. 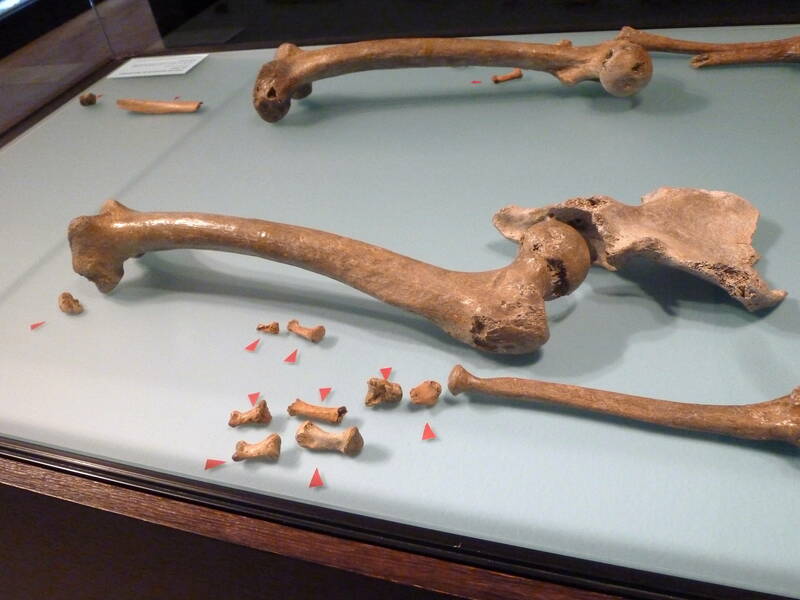 These are the bones of the original Neandertal from the Neander Valley. The museum has produced an excellent display of these most important discoveries. 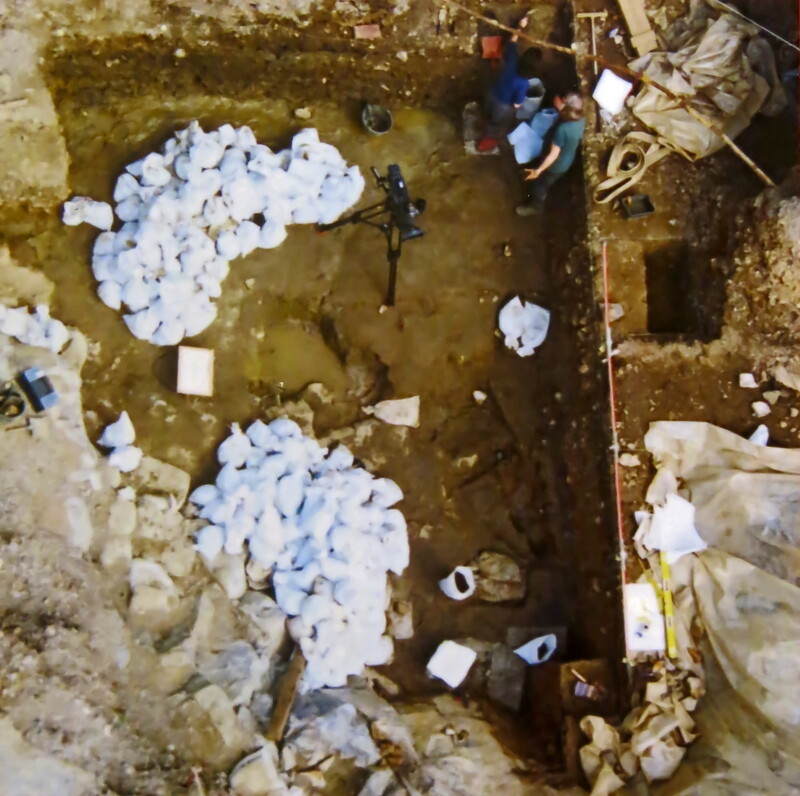 These two photographs do not include the additional fragments of the skeleton found in the 1997 - 2000 dig (shown in detail further down this page), when the original cave was rediscovered beneath rubble, and the detritus from the original excavation which had been thrown down twenty metres from the cave to the ground below was found and sieved to obtain many valuable bones from the original skeleton, undiscovered in the original excavation, since they were small, and/or caked with mud. The occipital bone joins the parietal bones along the lambdoidal suture. 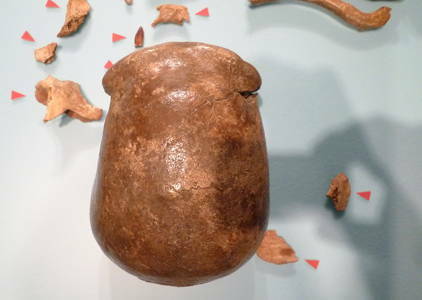 It forms the back of the skull and the base of the cranium. 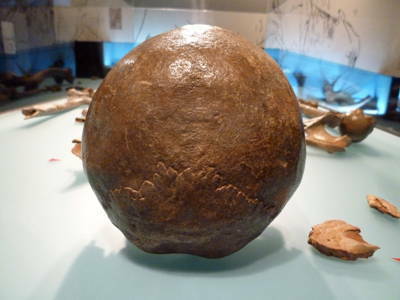 The lambdoidal suture, outlining the occipital bun is particularly obvious in this photograph of the back of the skull. Source: Original bones of the type specimen of Homo neanderthalensis, displayed at LVR-LandesMuseum Bonn. (left) This diagram shows the lambdoidal suture and the occipital bone clearly, viewed from the rear. 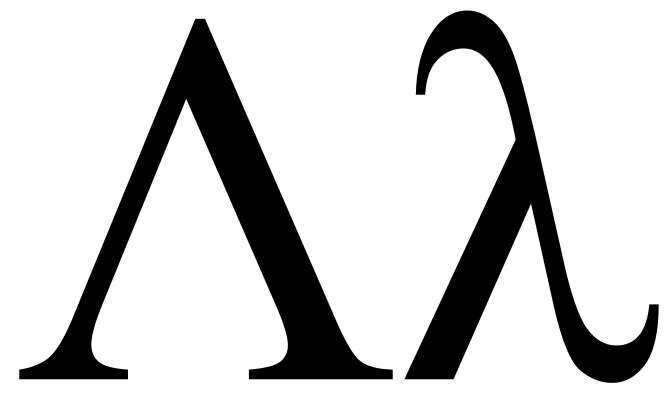 (right) The capital and lower case forms of the Greek letter Lambda, which inspired the name of the lambdoidal suture - alone it is the upper case Lambda, and in combination with the sagittal suture forms the lower case lambda. This version shows the partial skeleton superimposed over a drawing of the complete skeleton. 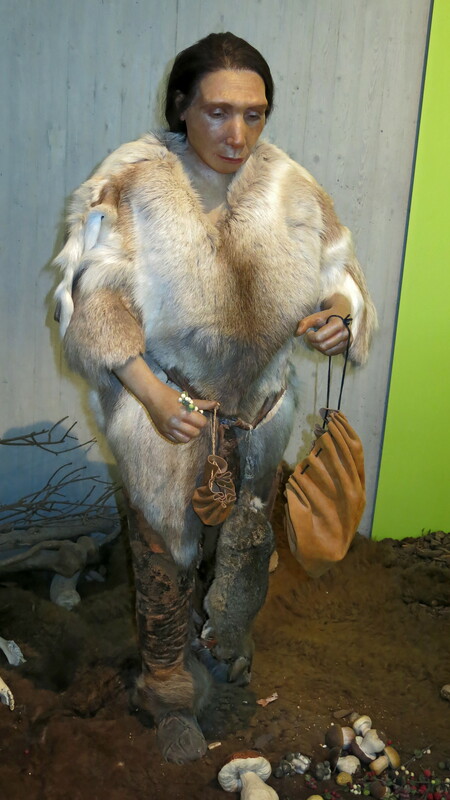 This is a reconstruction of the 1856 discovery of the Neanderthal. It is a superb recreation from Kennis & Kennis Reconstructions. Permission: by kind permission of Dr. Bärbel Auffermann, Deputy Director of the Museum, and in charge of Exhibition Management, Press and Public Relations. 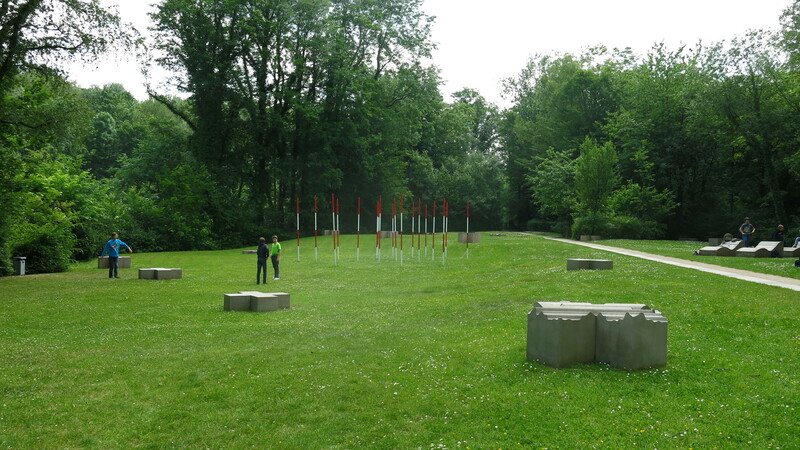 Patrons are invited to take photos of the sculptures at the exit of the Museum. Close up of the wonderfully true to life sculpture. This image demonstrates that a Neanderthal might well pass for an anatomically modern human if dressed correctly. 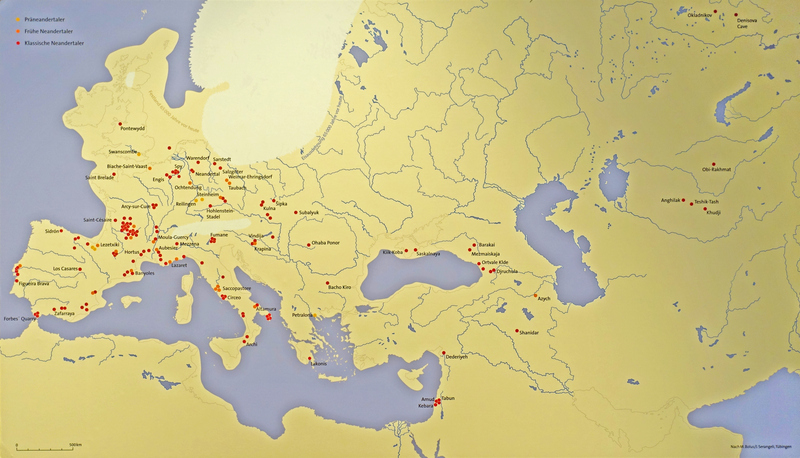 Map of Neanderthal sites, showing ancient coastlines. Kleine Feldhofer Grotte was a karstic limestone cave and a palaeoanthropologic site in the Neandertal Valley in western Germany. In August 1856, the Neanderthal type specimen was unearthed from the cave. 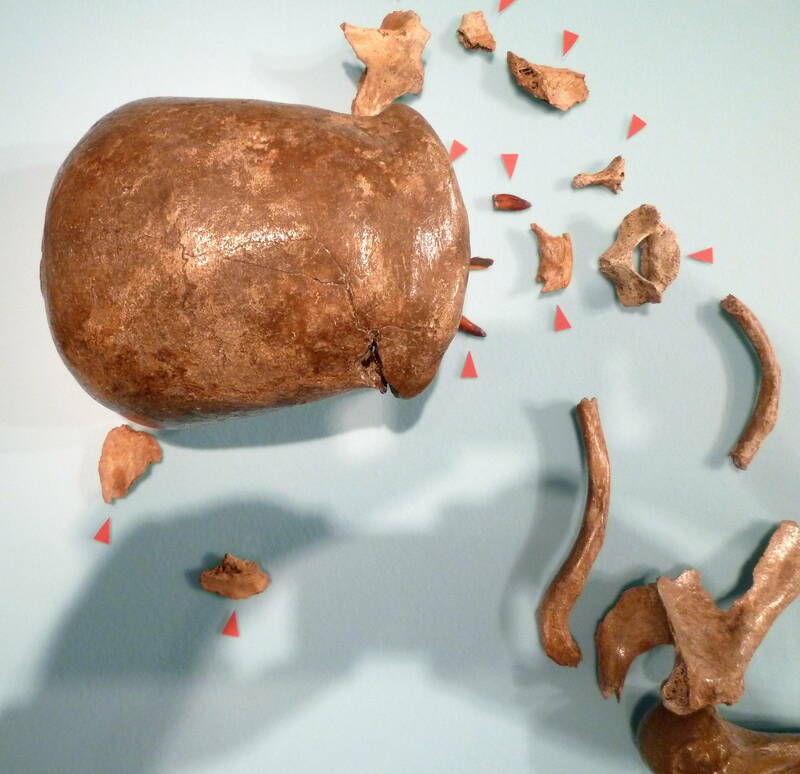 Miners uncovered a skull cap and a number of skeletal bones to be labeled Neanderthal. 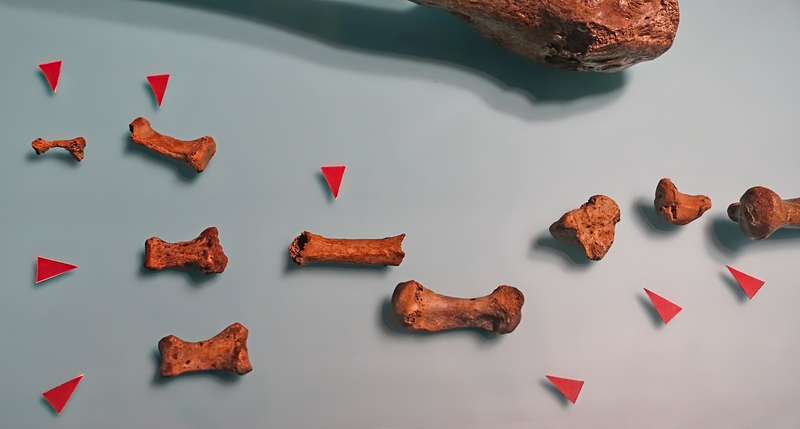 The bones belong to at least three distinct individuals. The cave was situated in a limestone gorge with the interior dimensions of 3 m (9.8 ft) in width by 5 m (16 ft) in length by 3 m (9.8 ft) in height, and a 1 m (3.3 ft) opening 20 m (66 ft) above the valley floor in the south wall which was 50 m (160 ft) high. 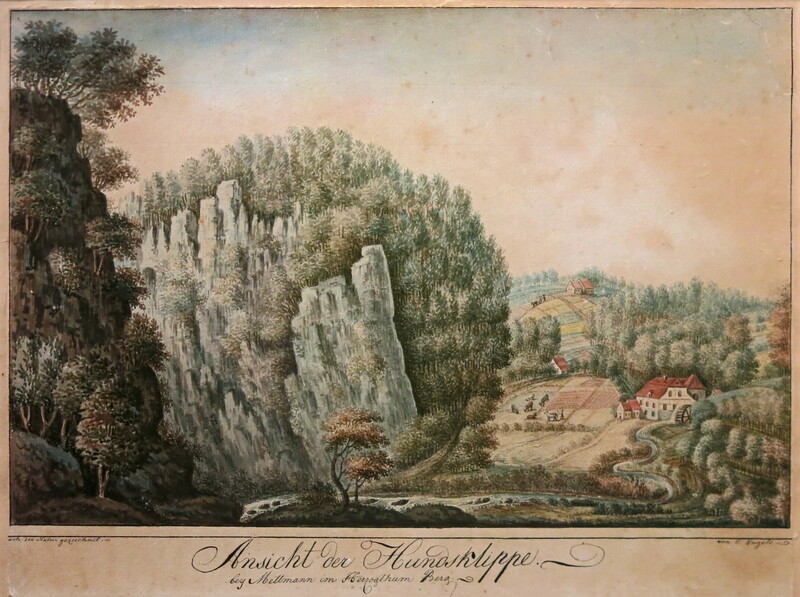 The cave got its name from the nearby large farm of the Feldhof. The cave was completely destroyed during the 19th century as a result of industrial-scale limestone quarrying which widened the gorge. The location of the cave was soon forgotten and by 1900, unknown. In 1997 a successful search for the site of the cave and its deposits yielded 24 fragments of human bone, one of which, identified as NN 13, fit exactly onto the left lateral femoral condyle of the Neanderthal 1 fossil. The 2000 excavation resulted in the recovery of thousands of artefacts. 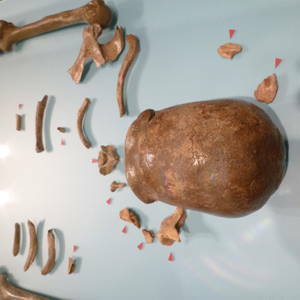 The mitochondrial DNA of two bone samples were fully sequenced, and completed in 2009. 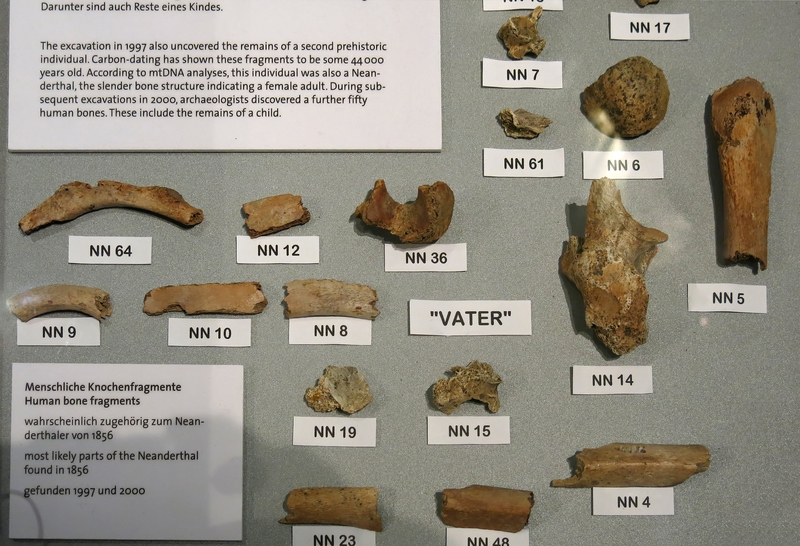 The new specimens are all smaller and/or more fragmentary than the bones recovered in 1856. 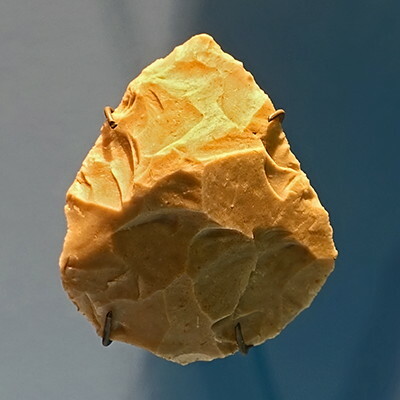 This is not surprising, because these specimens were thrown down an approximately 20 metre high rock face and subjected to breakage by subsequent quarrying activity while on the valley floor. 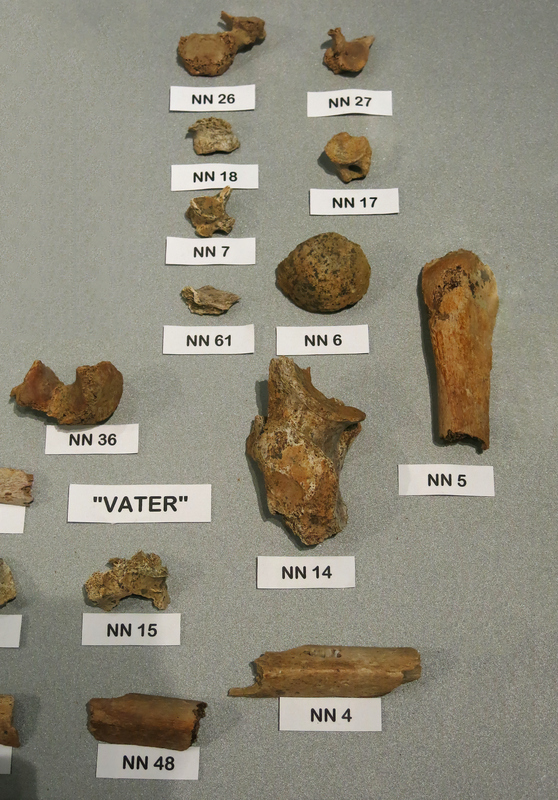 Although fragmentary, many pieces of bone have been refitted to form more complete elements. The Neandertal was originally called das Gesteins (the rock) , das Hundsklippe (the dog cliff) or just the Klipp. 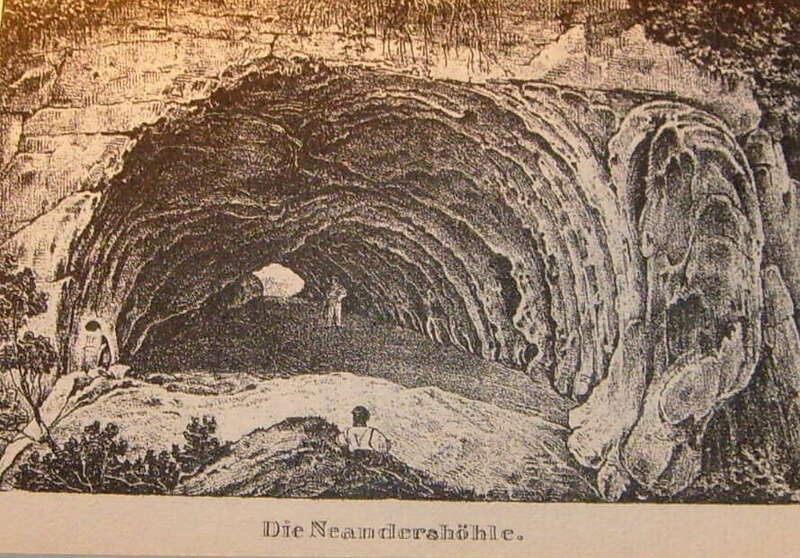 In the nineteenth century, it was renamed 'Neandertal', in memory of the well-known church music composer and Pastor Joachim Neander. 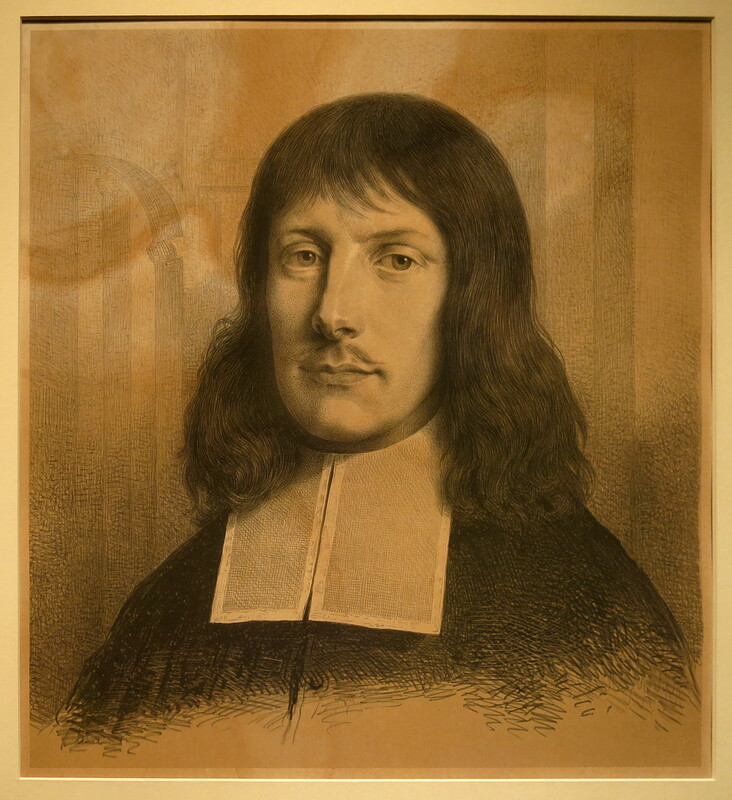 Joachim Neander (Neumann) (1650 – 31 May 1680) was a German Reformed (Calvinist) Church teacher, theologian and hymn writer whose most famous hymn was 'Praise to the Lord, the Almighty, the King of Creation' (German: 'Lobe den Herren, den mächtigen König der Ehren'). Neander wrote about 60 hymns and provided tunes for many of them. He is considered by many to be the first important German hymnist after the Reformation and is regarded as the outstanding hymn writer of the German Reformed Church. Joachim Neander was born in Bremen, the son of a Latin teacher. His grandfather, a musician, had changed the family name from the original Neumann ('New man' in English) to the Greek form Neander following the fashion of the time. After the death of his father, he could not afford to study at a famous university. He therefore studied theology in his hometown from 1666 to 1670. In 1671 he became a private tutor in Heidelberg, and in 1674 he became a teacher in a Latin school in Düsseldorf, one step before becoming a minister. 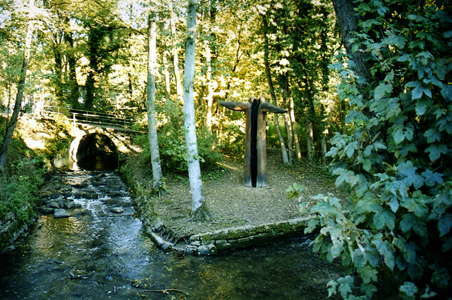 While living there, he liked to go to the nearby valley of the Düssel river, nature being the inspiration for his poems. He also held gatherings and services in the valley, at which he gave sermons. The Neandertal was renamed in his honor in the early 19th century, and became famous in 1856 when the remains of the Neanderthal Man were found there. In 1679, Neander became a pastor in Bremen, as his popularity with the common people had caused problems with the church administration in Düsseldorf. One year later, at the age of 30, he died of tuberculosis. Photo: Don Hitchcock 2015, of a lithograph, 19th century, after a missing oil painting. 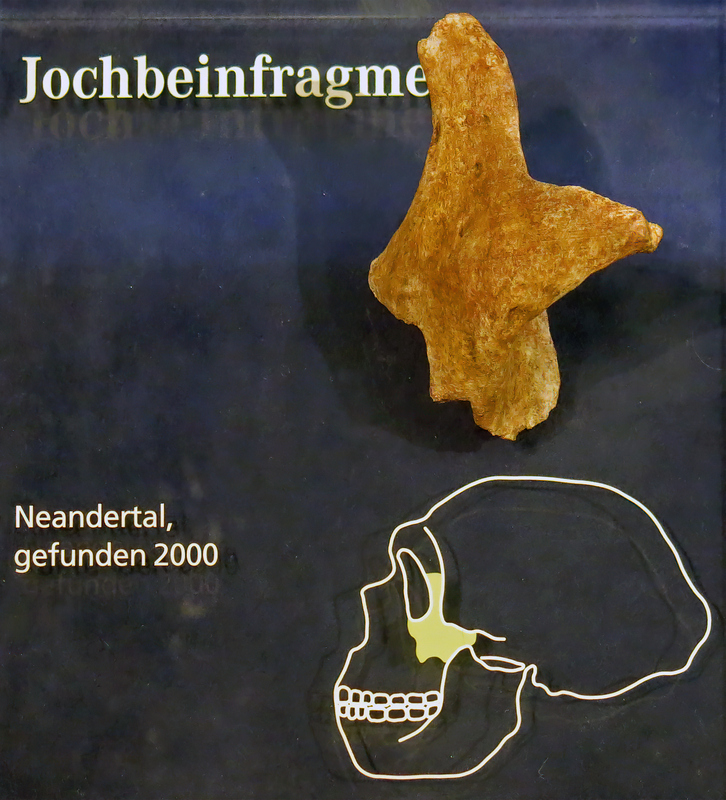 Source and text: Neanderthal Museum, Mettmann, near Düsseldorf, Germany. View of the 'Hundsklippe' rock near Mettmann in the Duchy of Berg, (Herzogthum Berg) Watercolour, by C.Engels about 1800 - Hundsklippe, is the old name for Neandertal. Three hikers looking at the Neander Cave. 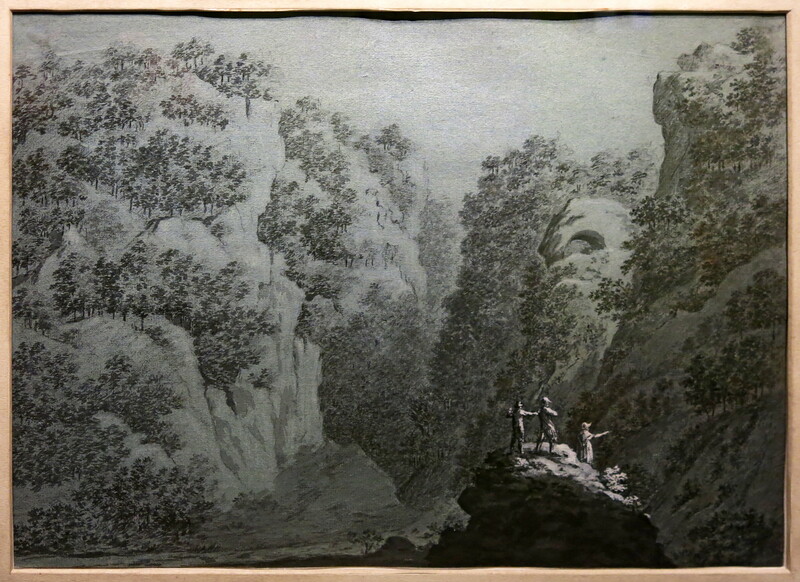 This drawing by the Rotterdam artist Gerardus Johannes Verburgh, 1803, is the oldest known depiction of the Neander Valley with the Neander Cave. 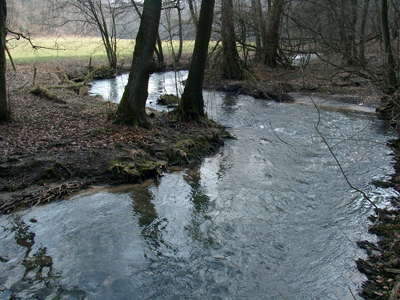 The hikers are facing west, looking downstream along the Düssel River. They are standing on top of the 'Engelskammer' or 'Rabenstein' rock formation on the right of the Düssel. 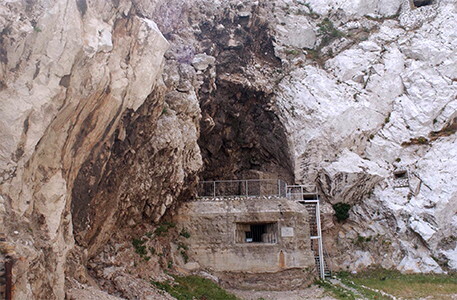 The Feldhof Cave was situated on the opposite side. Time and time again painters of the Düsseldorf academy and the Netherlands frequented the Neander Valley during the 19th century. These artists recorded its extraordinary beauty in their works and occasionally held colourful festivals in its caves. Over 150 works of art can be attributed to the Neander Valley today. Amongst these are works by Schirmer, Koekkoek, Achenbach and de Leeuw. Julius Buddeus was a Düsseldorf print publisher of the 1830s and 1840s. Part of the Neander Valley, painted on site. Friedrich Wilhelm Schreiner, 1855, oil on cardboard. The Habris Foundation supported the purchase and restoration of this painting. 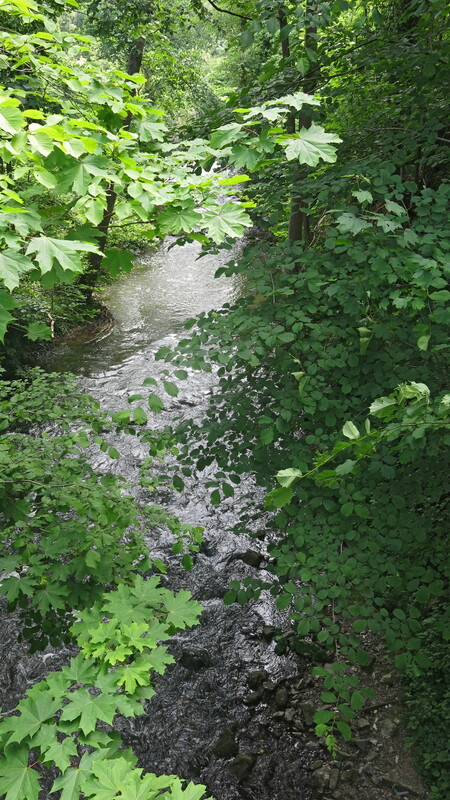 Stream in the Neander Valley. Photo:	March 18, 2006, http://www.cordula.ws/, Cordula, Cordula's Web. Permission: Creative Commons Attribution Share-alike 2.5 Generic licence. Here we see the skeleton laid out with the bones in the correct relation to each other, with red triangles indicating the extra bones found in the relatively recent excavations of 1997-2000, a wonderful addition to the specimen. 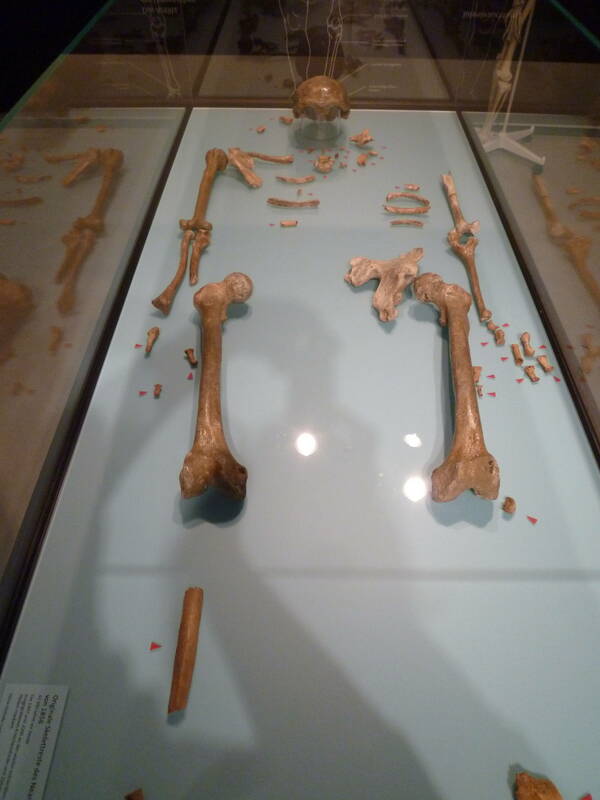 It is most unusual to see the complete skeleton laid out in this way. 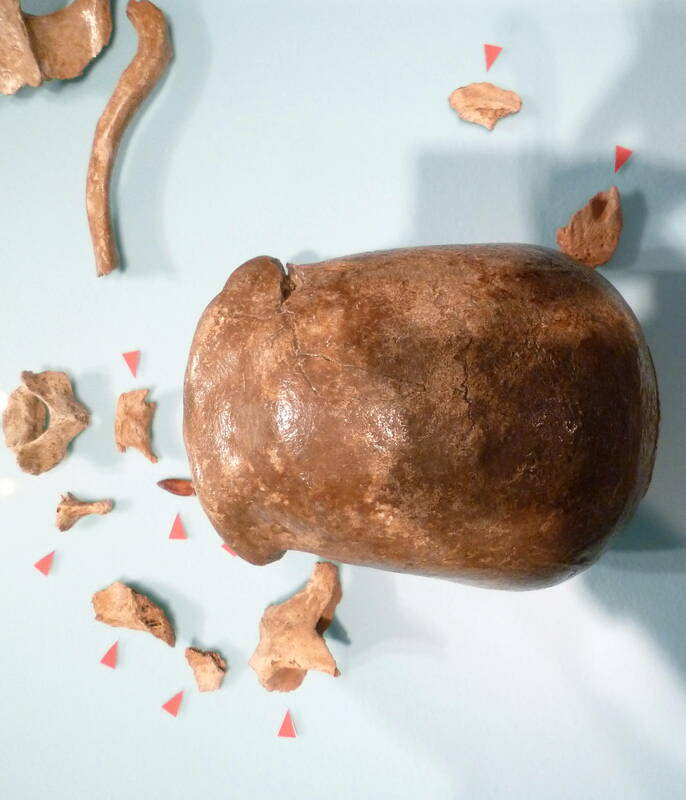 Most textbooks show an overhead shot of the cranium only. The red arrows point to recently discovered bones found during the 1997-2000 excavations at the original site, and belonging to the Neanderthal skeleton discovered in 1856. One of the distinguishing features of a Neanderthal skull is the prominent brow ridge, very evident in these photographs. Here we can also see the right clavicle or collar bone, displaying the double curvature characteristic of Western Neanderthals (Condemi, 2006) , which is also characteristic of anatomically modern humans. 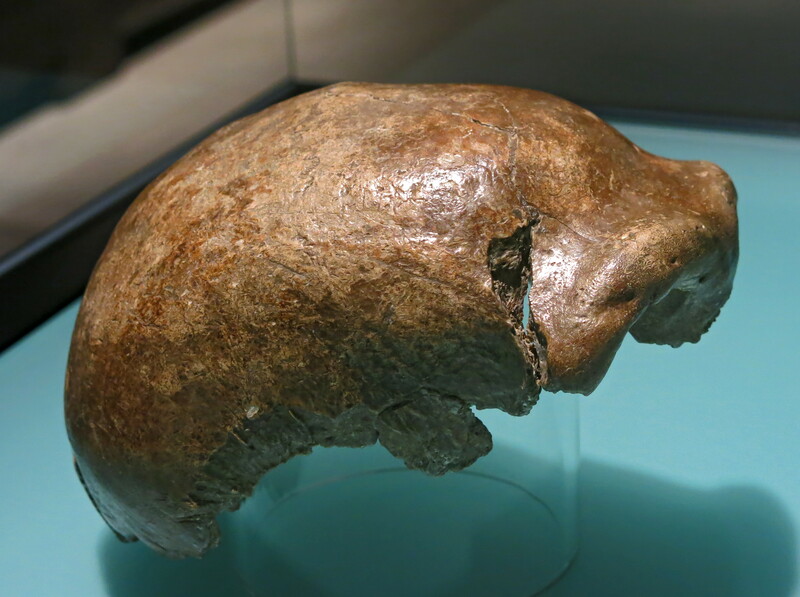 Here we can see clearly the characteristic occipital bun of the Neanderthals. 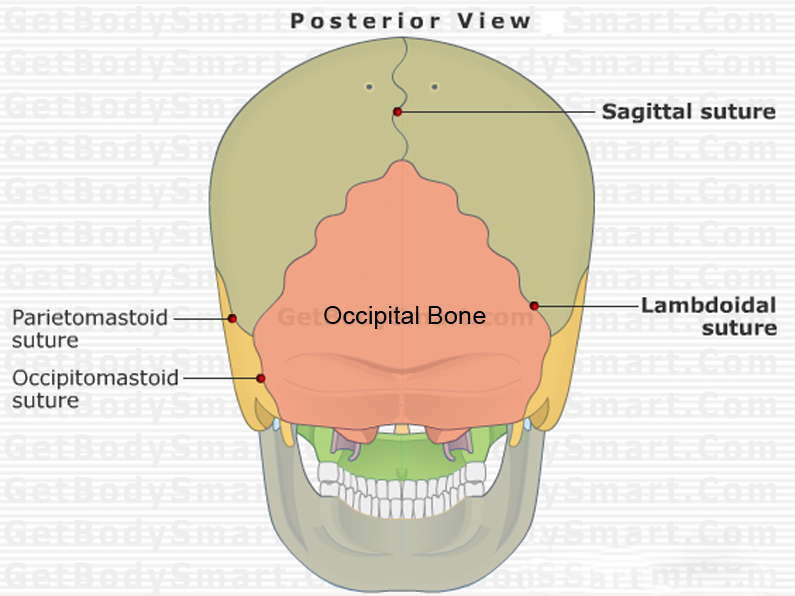 Occipital bun is a morphological term used to describe a prominent bulge, or projection, of the occipital bone at the back of the skull. 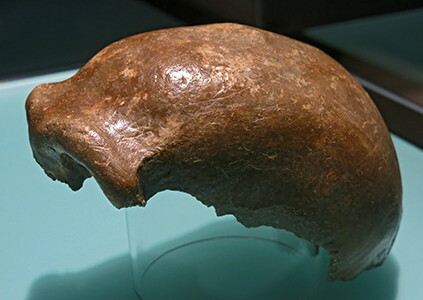 The term is most often used in connection with scientific descriptions of classic Neanderthal crania. 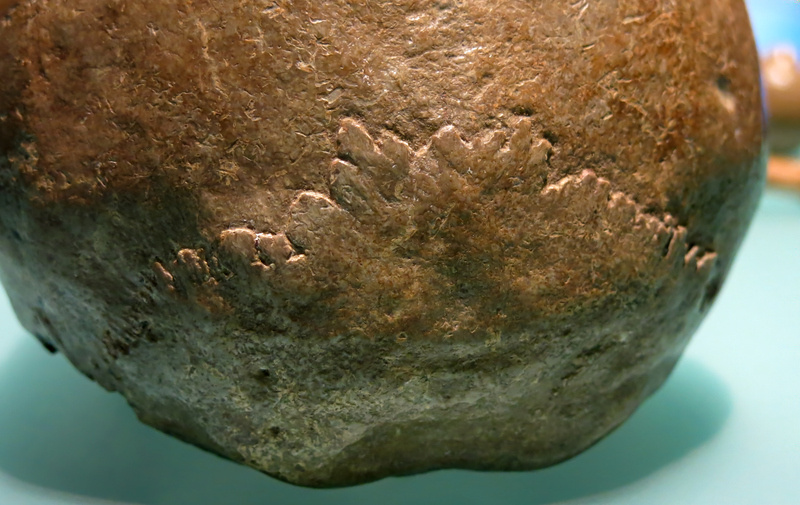 While common among many of mankind's ancestors, primarily robust relatives rather than gracile, the protrusion is relatively rare in modern Homo sapiens. 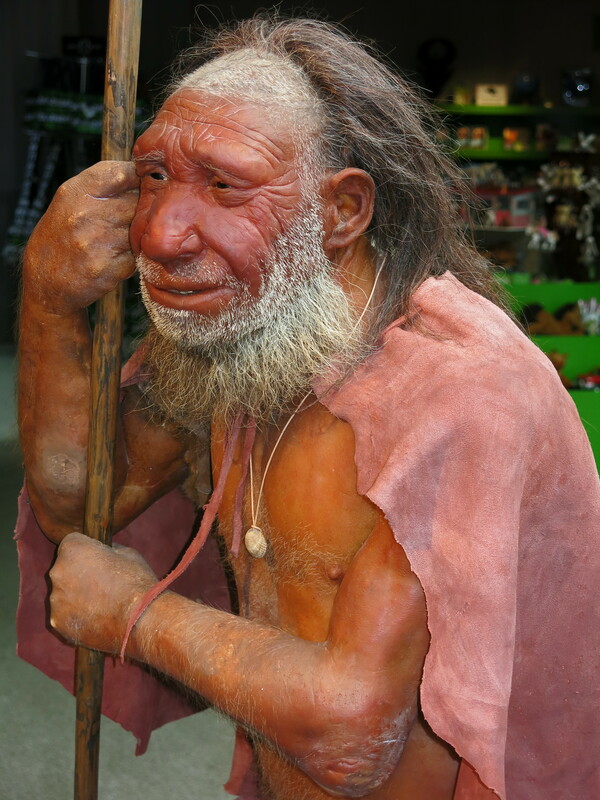 Another superb version of the original Neanderthal, by Atelier Manufaktur, München. 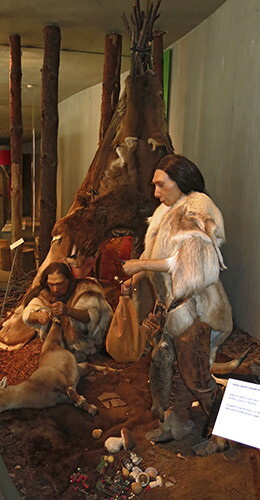 These excellent models of the type specimen Neanderthal, apparently by the same sculptor/atelier, show the clothes likely to be worn in what was for much of the time very cold conditions. Neanderthals had a physique adapted to periglacial conditions, but furs would have been essential for survival. They must have been adept at curing, cutting, and sewing pelts for warm clothing and footwear. Sculpture of a male Neanderthal. Forbes' Quarry is located on the northern face of the Rock of Gibraltar within the Upper Rock Nature Reserve in the British Overseas Territory of Gibraltar. The area was quarried during the 19th century to supply stone for reinforcing the fortress' military installations. In the course of the quarrying, a limestone cave was found. 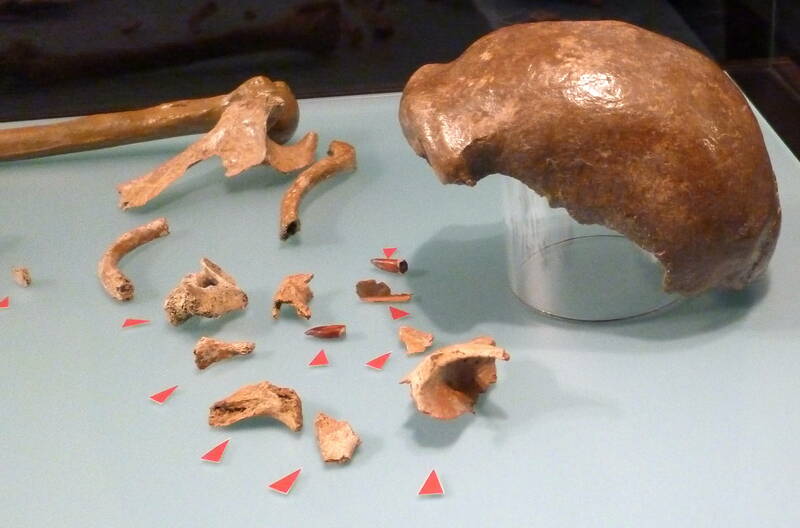 The second ever Neanderthal discovery was made within this cave when Captain Edmund Flint found the skull of an adult female Neanderthal in 1848. 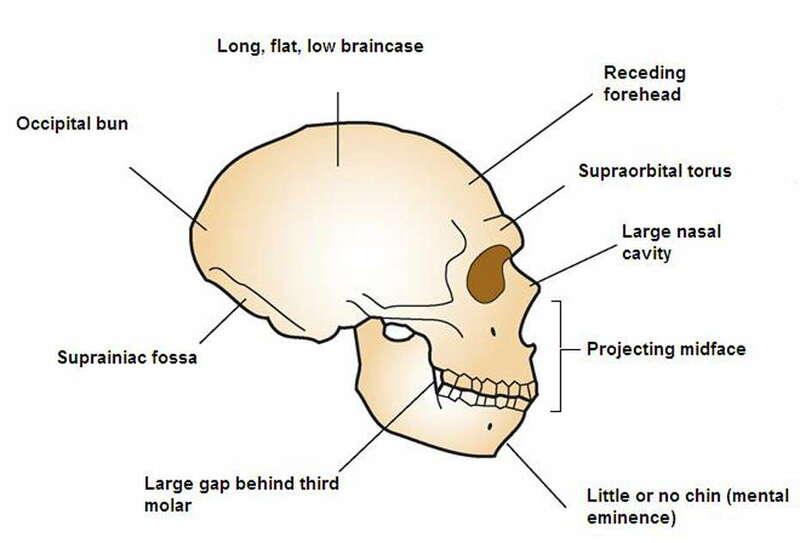 This diagram shows the important parts of the skull of a typical Neanderthal, including the occipital bun. Some scientists suspect occipital buns might correlate with the biomechanics of running. Another theory attributes them to enlargement of the cerebellum, a region of the brain which mediates the timing of motor actions and spatial reasoning. There are still many human populations which often exhibit occipital buns. 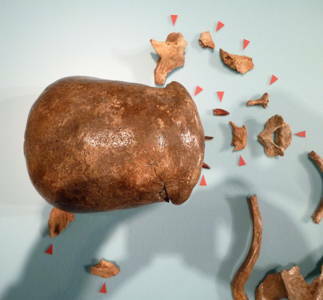 A greater proportion of early modern Europeans had them, but prominent occipital buns even among Europeans are now relatively infrequent. 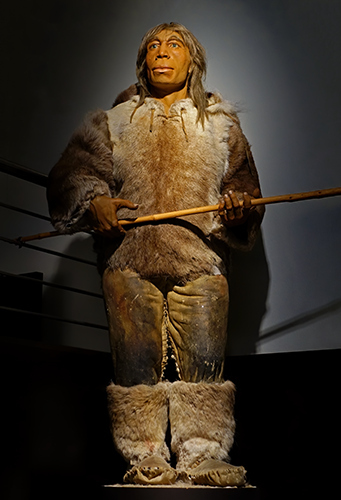 They are still found fairly often among Basque, Sami and Finn individuals. 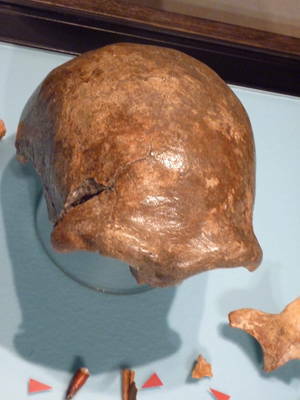 Bushmen from South Africa and Australian aborigines often have occipital buns also. Permission: Creative Commons Attribution-Share Alike 2.5 Generic licence. Großes, nach außen gedrehtes Hüftgelenk - Large hip rotated towards the outside. Gebogene Oberschenkelknochen - Curved femur. Source: Display at LVR-LandesMuseum Bonn. Racloirs, side scrapers, from the Neander Valley. On loan from the LVR - LandesMuseum Bonn, Germany. 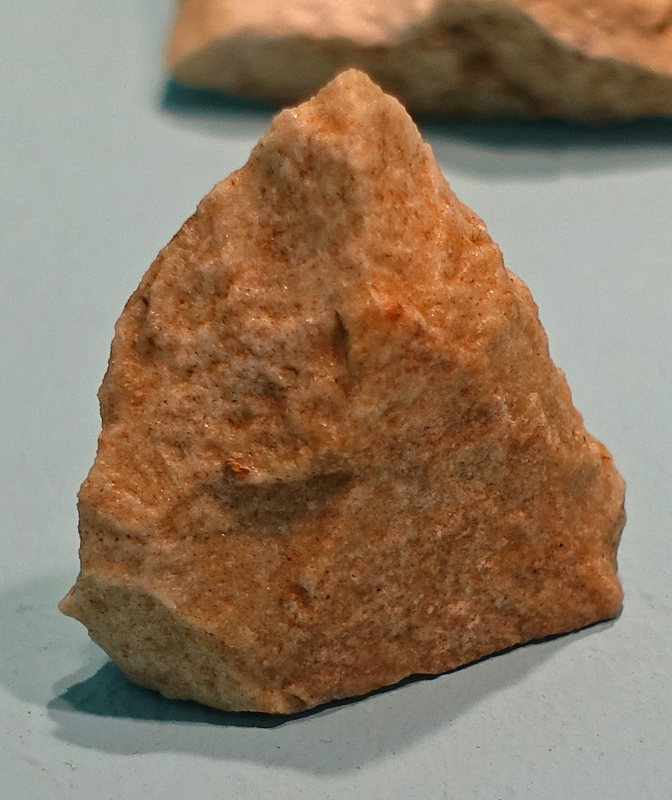 This is labelled a 'Racloir Biface', or two faced side scraper. 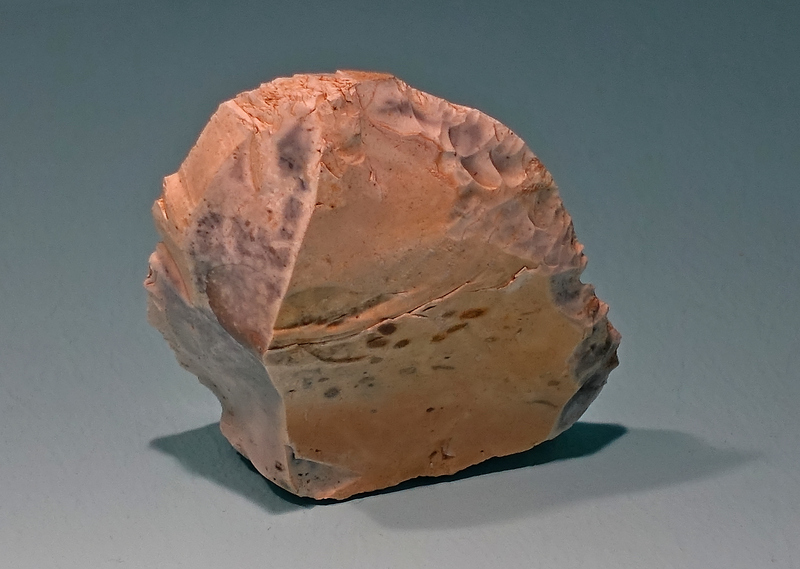 Flint, circa 42 000 BP. Small flint biface from the Neander Valley. Nucleus / Core, quartzite, from the Neander Valley. 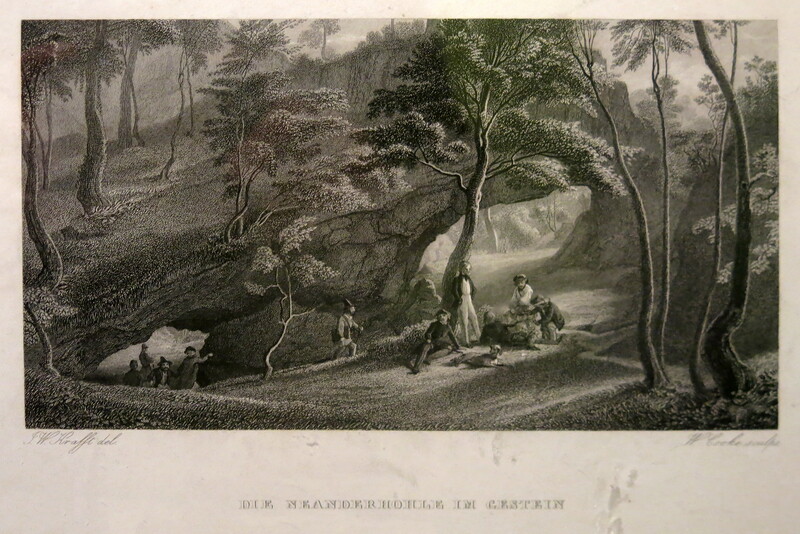 A mere 16 bones made up the mysterious finding discovered by workmen clearing Feldhof Cave in August 1856. They were immediately identified as human remains by Johann Carl Fuhlrott, the first person to examine them. Little is known about the circumstances surrounding the finding. The skeleton is said to have been lying on its back and buried 60 cm deep in the cave's clay with the head pointing towards its entrance. We know today that bones of the species found in the Neander Valley had already been discovered before 1856, in Belgium and Gibraltar. 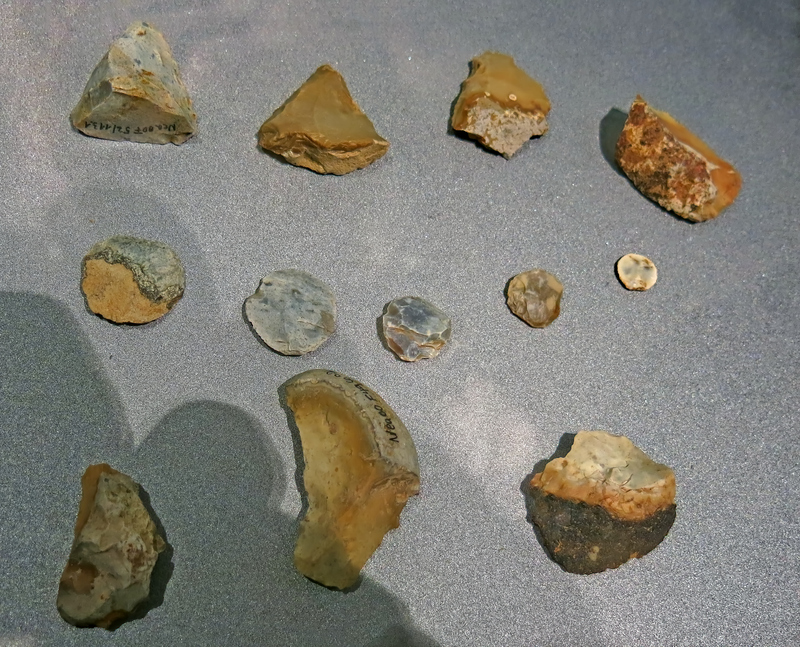 These fossils however were largely ignored. 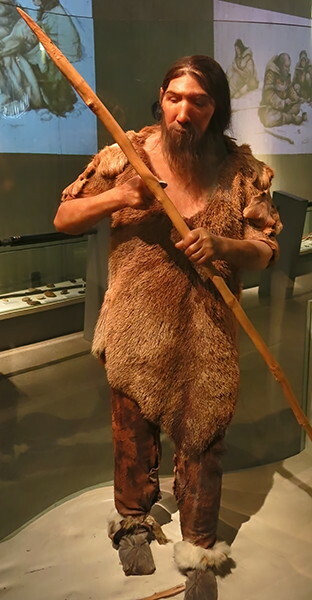 The Neanderthal discovery became famous because it coincided with Charles Darwin's pioneering work 'On the Origin of Species by Means of Natural Selection'. 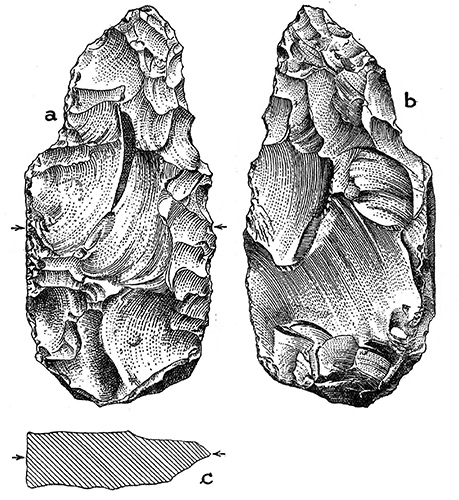 This groundbreaking book was published in England three years after the Neanderthal discovery. Following Darwin's theory, the recent find was soon cited as crucial evidence that humans too had evolved from primitive ancestors. 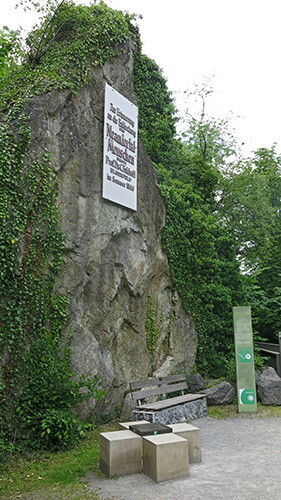 Text: Neanderthal Museum, Mettmann, near Düsseldorf, Germany. This Google Earth image shows the exact place where the original Neanderthal remains were discovered, now delineated by a road, the Düssel River, two bridges over the river, and a walking track, all of which may be discerned in this aerial photograph when compared with the useful tourist map above. The Kleine Feldhofer Grotte was a karstic limestone cave and a paleoanthropologic site in the Neandertal Valley in western Germany. 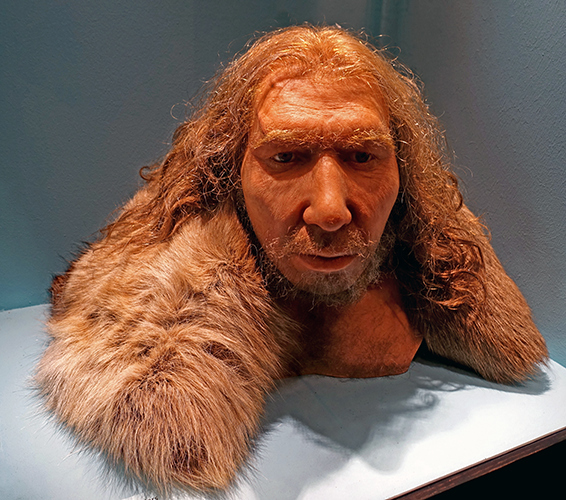 In August 1856, the Neanderthal type specimen was unearthed from the cave. Miners uncovered a skull cap and a number of skeletal bones which were labeled Neanderthal. The bones belong to at least three distinct individuals. The cave was situated in a limestone gorge with the interior dimensions of 3 m in width by 5 m in length by 3 m in height, with a 1 m opening 20 m above the valley floor in the south wall, which was 50 m high. 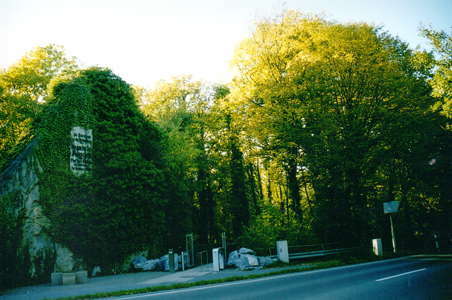 The cave got its name from the nearby large farm of the Feldhof. 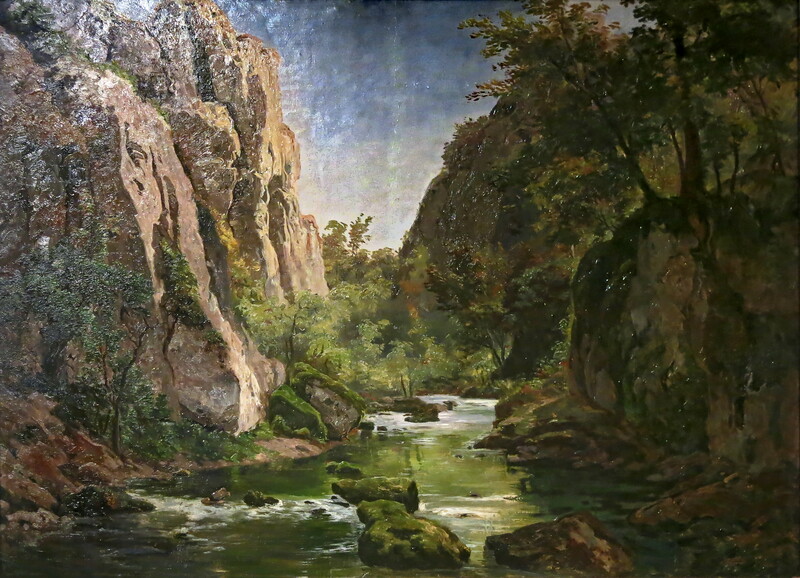 The cave was destroyed during the 19th century as a result of industrial-scale limestone quarrying which widened the gorge. The location of the cave was soon forgotten and by 1900, unknown. The new specimens are all smaller and/or more fragmentary than the bones recovered in 1856. This is not surprising, because these specimens were thrown down an approximately 20-m rock face and subjected to breakage by subsequent quarrying activity while on the valley floor. Although fragmentary, many pieces of bone have been refitted to form more complete elements. After the excavations were complete, the dig was filled in, levelled, and grassed, and is now an archaeological park. 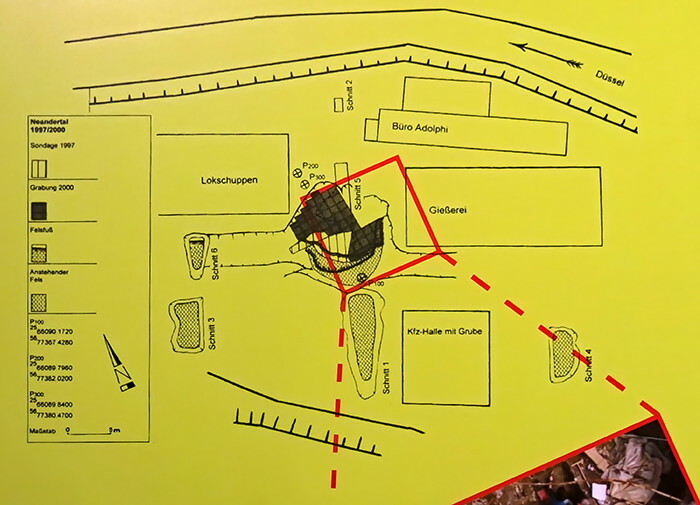 Blueprint of the archaeological excavations of 1997 and 2000. 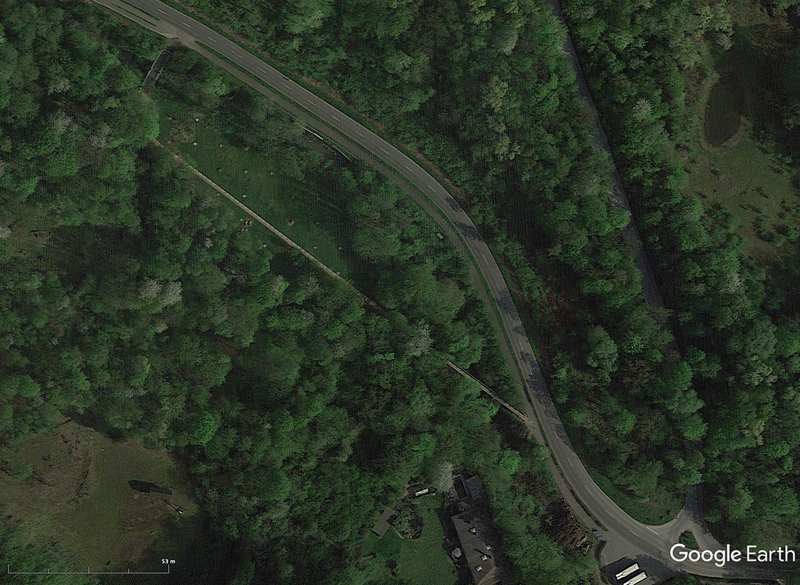 A stone quarry and junkyard - structures dating back to former land utilisation - have been plotted as well. 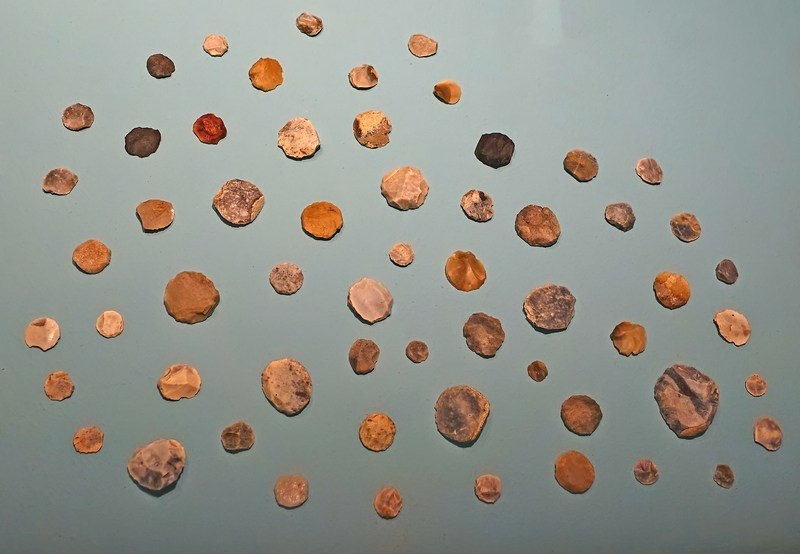 The archaeologists filled the cave's clay into sacks to elutriate it (separate out the artefacts by washing in water) and sift through it for further findings. Source and text: Poster, Neanderthal Museum, Mettmann, near Düsseldorf, Germany. Feine et al. 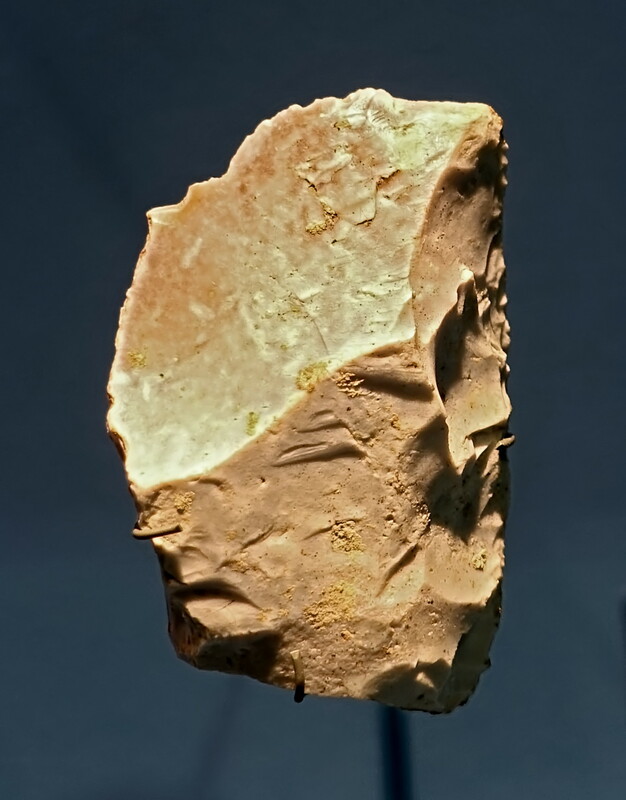 (2015) found much evidence for the anthropogenic use of faunal resources, which were recovered alongside the stone artefacts and human skeletal remains from the rediscovered cave sediments in the Neander Valley. These include three types of finds: charred bones as evidence for the use of fire, bones with cut and blow marks as evidence for their connection with food procurement and as raw material, as well as artefacts made out of bone, antler or ivory. 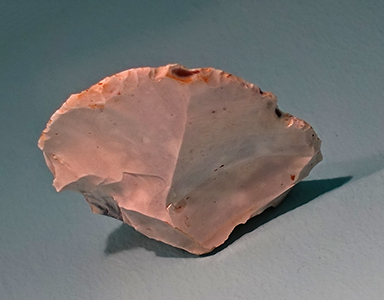 The Middle Palaeolithic inventory is associated with an intensive use of fire. Various animal species, primarily the horse, were used as hunting prey and for providing raw materials. 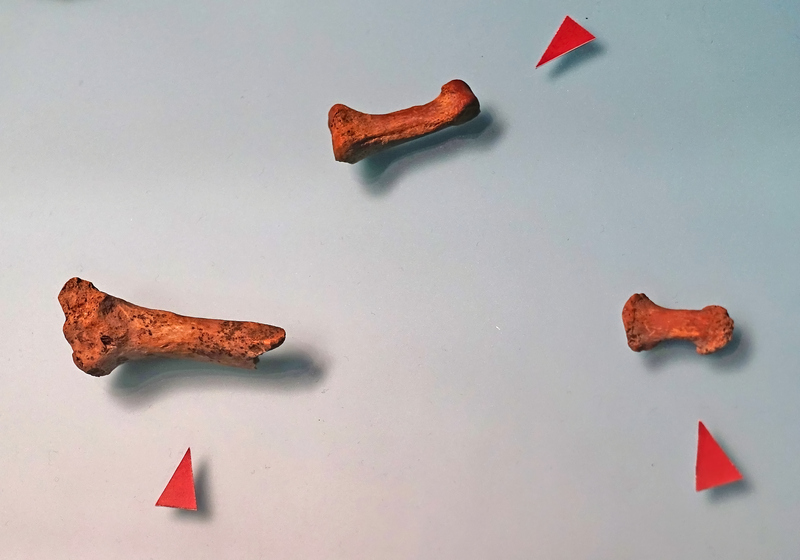 Four retouchers made out of long bones from horses were found within the range of the Middle Palaeolithic find distribution. Bone fires were also used in the Upper Palaeolithic in the Neander Valley, although to a lesser extent than in the Middle Palaeolithic. The site has been addressed as a hunting camp due to the type of stone tools found at the site. 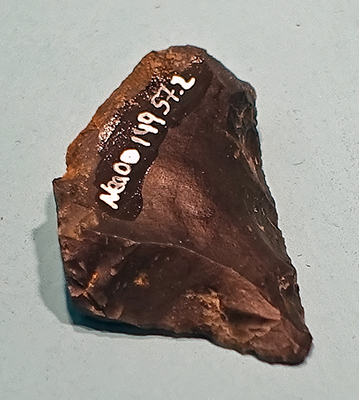 This functional address of the site has been confirmed by the recovery of five projectile point fragments made out of bone, antler and ivory. Quantitative distribution of the charred bones in form of different sized spheroids and their spatial distribution in relation to the Upper and Middle Palaeolithic find distributions. 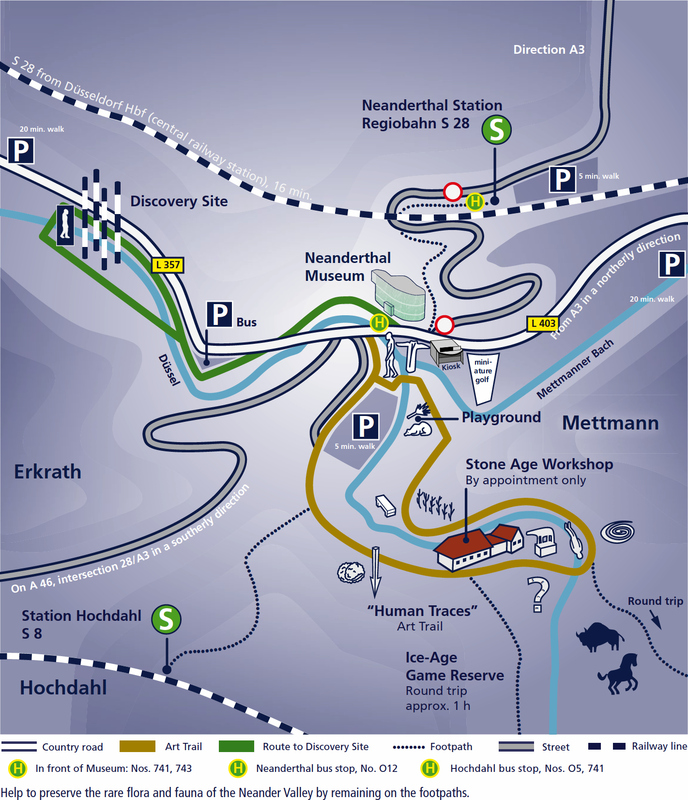 Above and to the left on this image is the layout of the Kleine Feldhofer Grotte. To the right and below is the Feldhofer Kirche, a cave which yielded upper Palaeolithic remains, including some from the Gravettian period. Aerial shot of the dig. 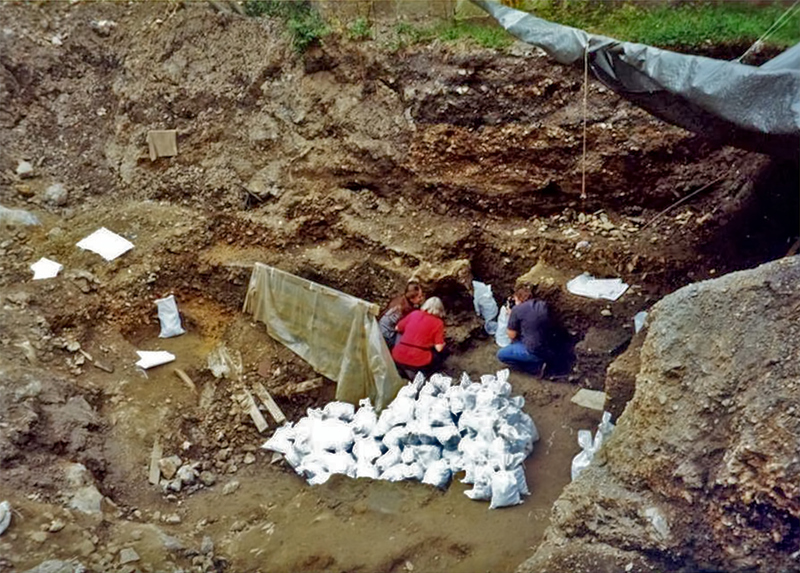 Here we can see the bagged dirt ready for removal to the laboratory for further sifting and analysis, to find bones and tools not found in the initial dig. This is now standard practice in archaeological excavations. 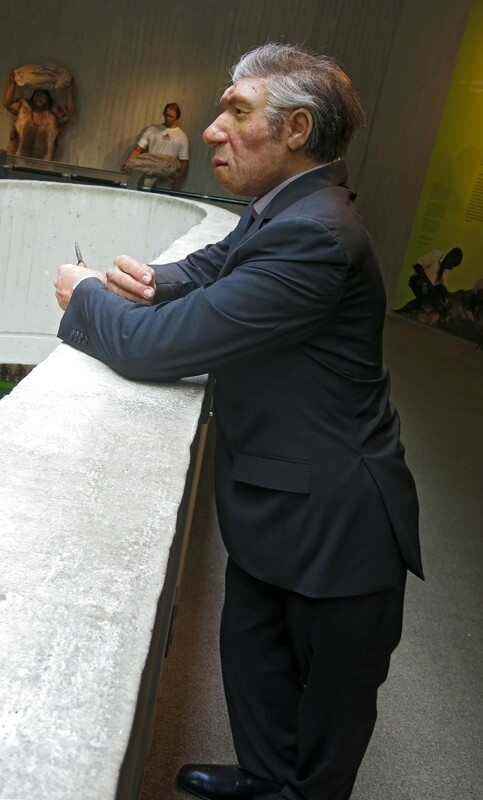 This is a delightful photograph from the Neanderthal Museum in Mettmann, Germany. The skeleton lacks the skull below the eye sockets, as well as the jaw. I find this strange, as jaws, and especially teeth, are often very well preserved in cases of this type. 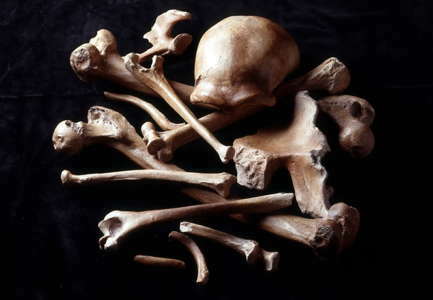 The original set of bones discovered in 1856. Various views of the skull and nearby bones from above. 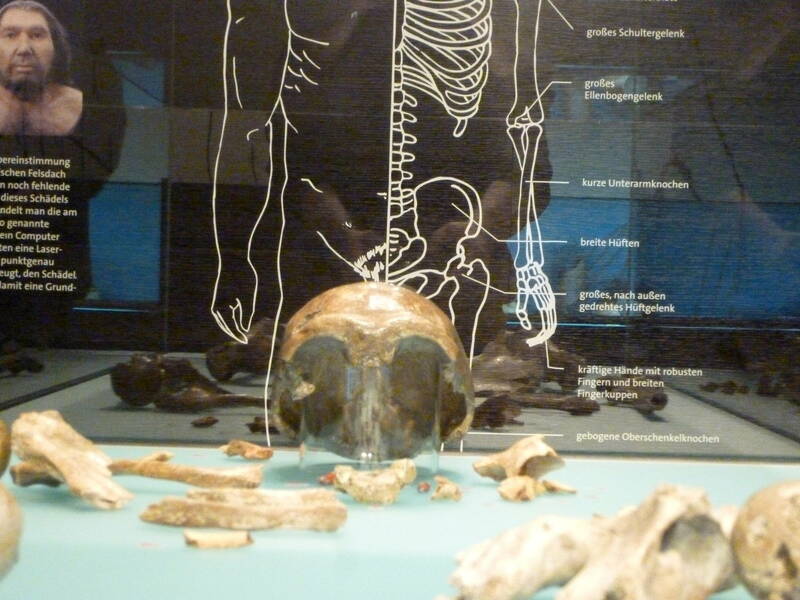 The skeleton of the original Neandertal. Source: Original bones, apart from the skull, of the type specimen of Homo neanderthalensis, displayed at LVR-LandesMuseum Bonn. 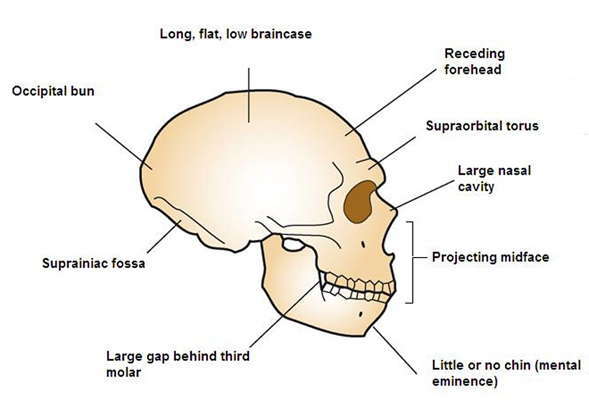 The top of the skull, the cranial vault, comprising the Frontal, Parietal, and Occipital bones, was discovered, but not the eye sockets, cheeks, teeth and jaws. The original Neanderthal calotte, or cranial vault. 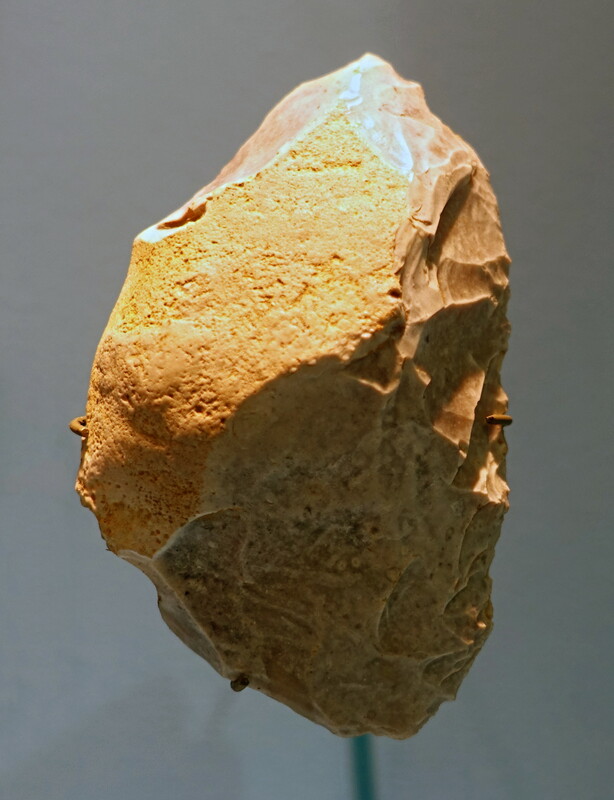 This is the original, lent for a major exhibition of Neanderthals at the Musée de l'Homme in Paris, Néandertal L'Expo, open to the public during the period 28.03.2018 to 07.01.2019. Source: Original, Musée de l'Homme, Paris, on temporary loan from the LVR-LandesMuseum Bonn, 23.03.2018 - 15.01.2019. 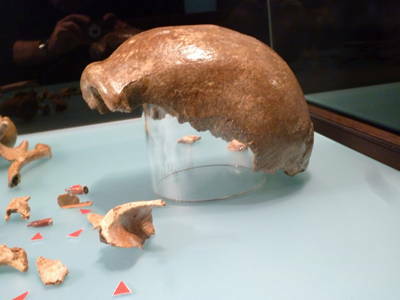 Head and thorax of the original Neanderthal. 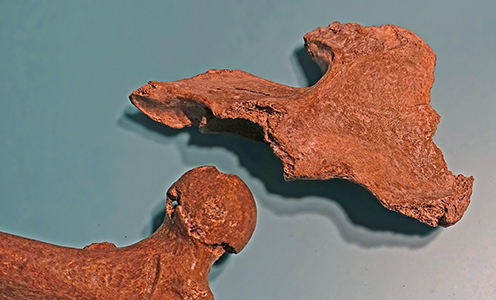 The cranial vault, a vertebra, several smaller bones, a right clavicle, and some parts of ribs are all that were recovered from this part of the specimen. Right humerus, running from the shoulder to the elbow. 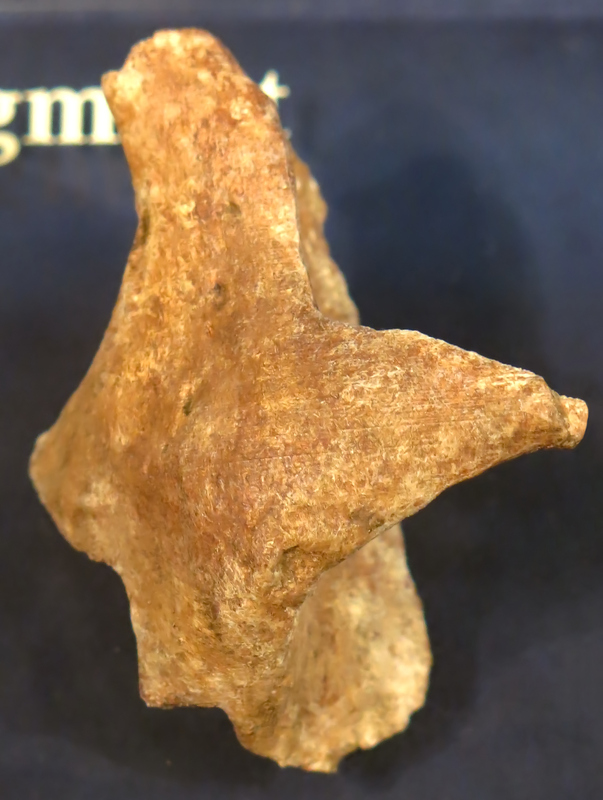 On the left of this image we can see the head of the humerus and what remains of the scapula, while on the right we can make out the depressions of the Radial and Coronoid fossae, as well as the Capitulum and the Trochlea. 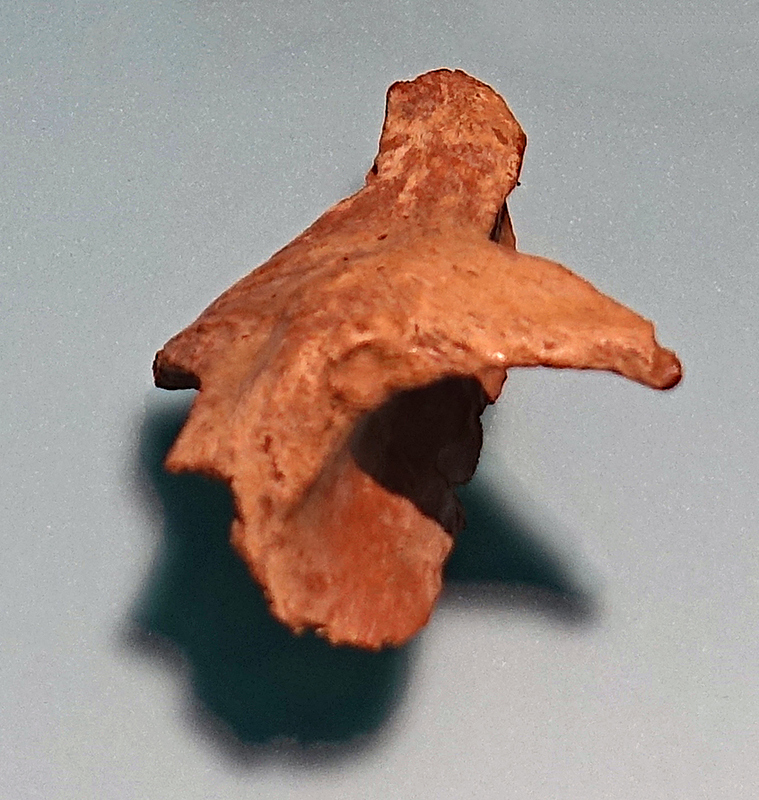 Another view of the scapula. 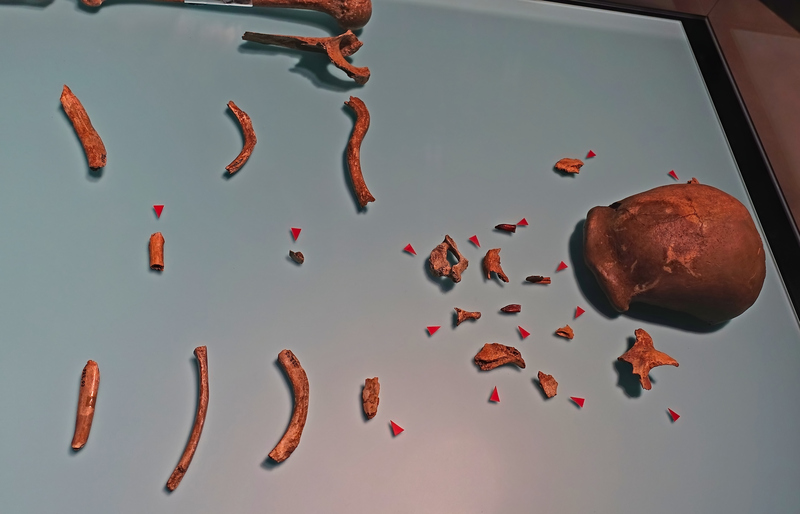 Another view, including the clavicle (collar bone), scapula (shoulder blade), and five rib fragments. Right hand side radius and ulna. The image of the ulna, the upper bone in the image above, shows to advantage the olecranon process, the bony tip of the elbow. The ulna is a long bone found in the forearm that stretches from the elbow to the smallest finger, and when the palm of the hand is held uppermost, it is the bone closest to the body. It runs parallel to the radius, the other long bone in the forearm, and is the larger and longer of the two. The radius extends from the lateral side of the elbow to the thumb side of the wrist and runs parallel to the ulna. The radius is shorter and smaller than the ulna. It is a long bone, prism-shaped and slightly curved longitudinally. The radius is part of two joints: the elbow and the wrist. At the elbow, it joins with the capitulum of the humerus, and in a separate region, with the ulna at the radial notch. At the wrist, the radius forms a joint with the ulna bone. 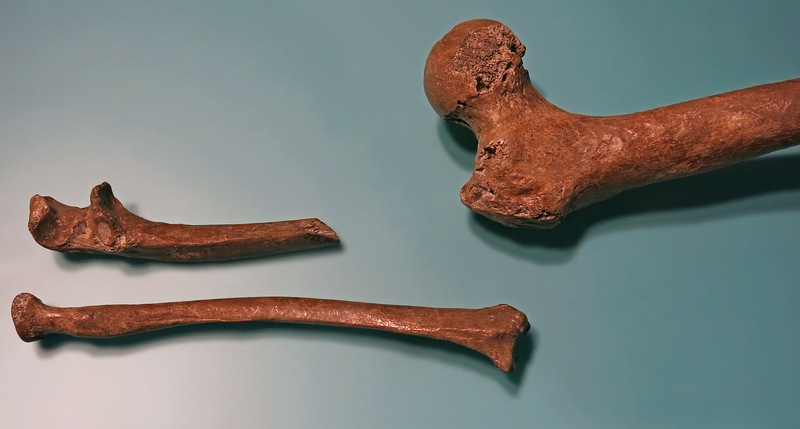 Radius, ulna, and the top of the right femur. 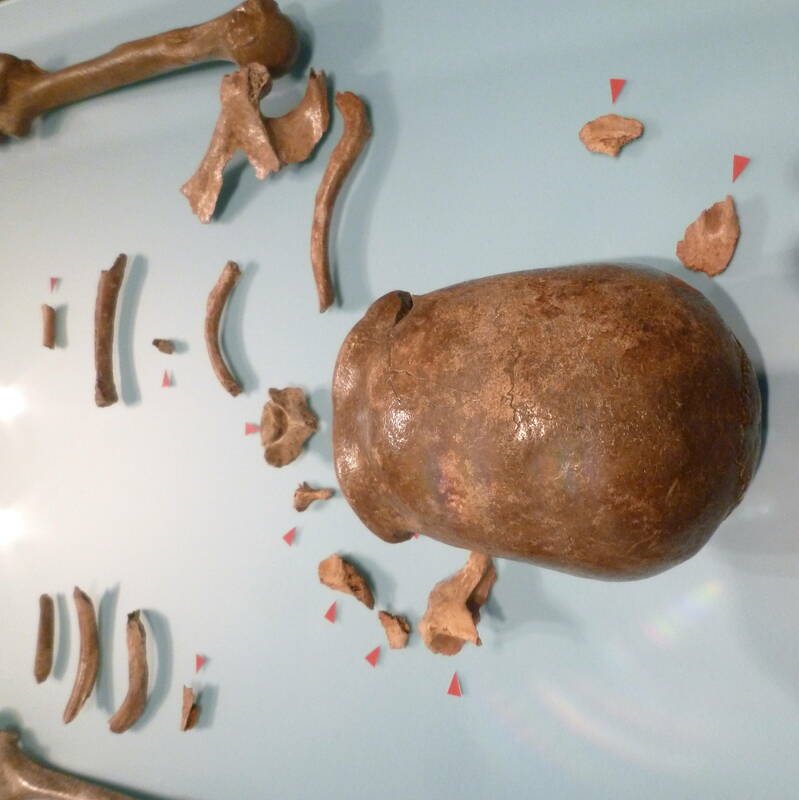 We can make out here the semi spherical femoral head which fits into the corresponding socket on the pelvis, the femoral neck, the long and curved cortical bone, and the condyle, forming part of the knee joint, on the right of this image. 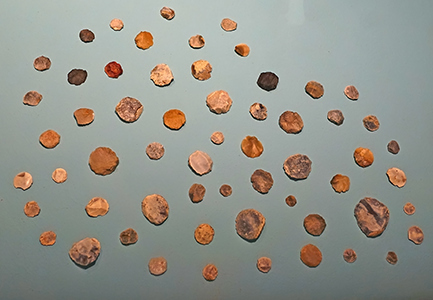 The fragments discovered in the 1997 - 2000 excavations have been marked by small red arrows in the display case. (left): possibly part of the left foot or ankle. (right): possibly part of the right foot or ankle. 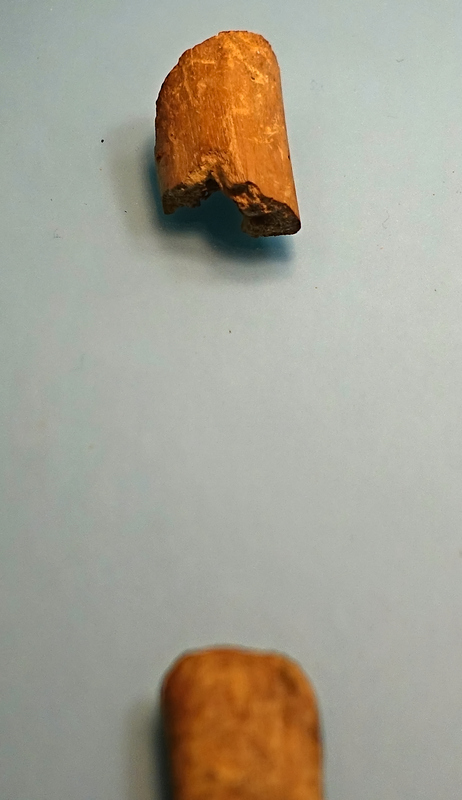 Possibly part of the right tibia or fibula, found in the 1997 - 2000 campaign. 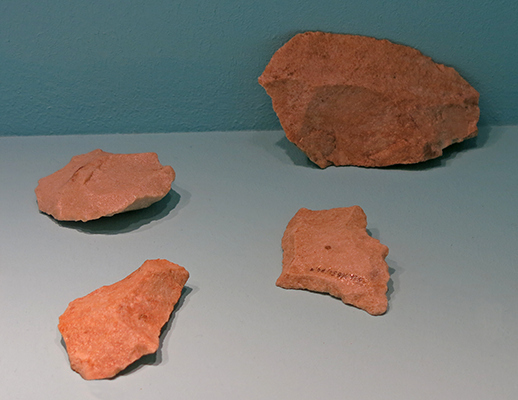 Fragments of the right hand, found in the 1997 - 2000 campaign. 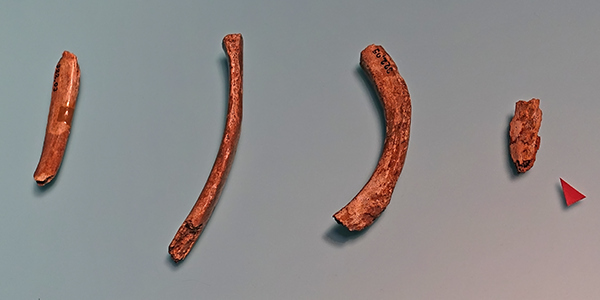 Four left hand side rib fragments, one of which was found in the 1997 - 2000 campaign. Left femur and part of the pelvis. Fragment of the pelvis and the femoral head on the left of the skeleton. 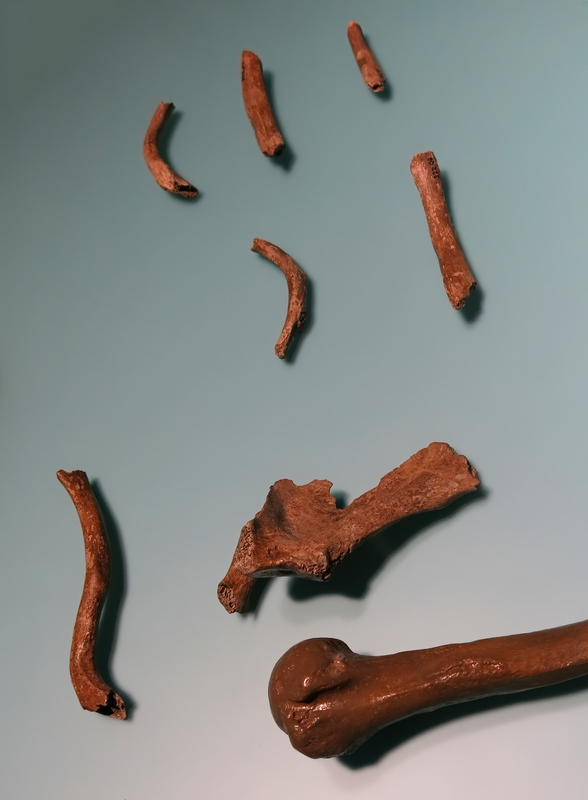 Fragments of the left hand and wrist of the skeleton. 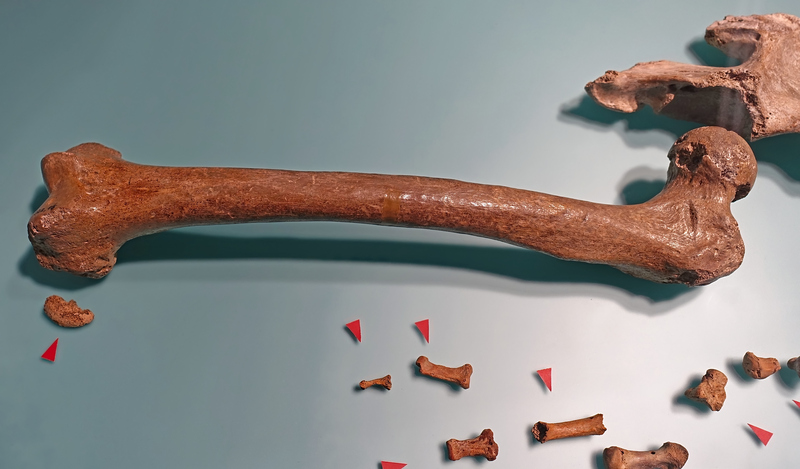 The left femur, with part of the socket into which it fits in the hip. 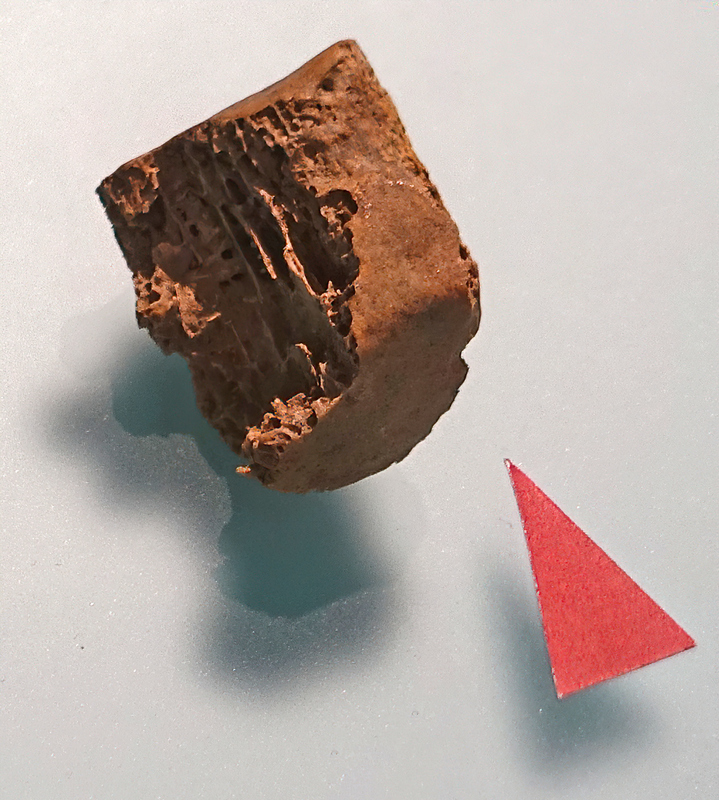 The red triangles point to extra bones from the left hand of the original specimen which were found recently in the 1997 - 2000 excavations in the original site in the Neander Valley. It must have been exciting for the discoverers to find so many extra bones from possibly the most important skeleton in the history of anthropology! 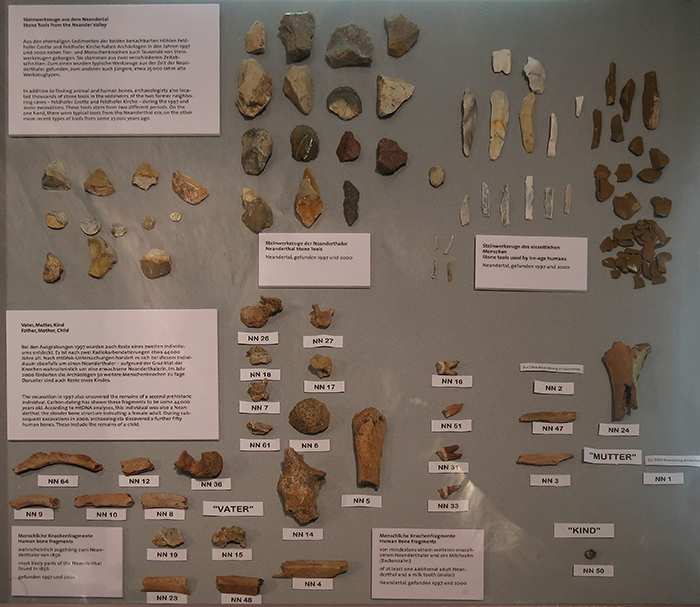 This poster and facsimile (left and centre) shows one of the pieces found in 1997 - 2000 and where it fits in the skeleton. The original on the right. 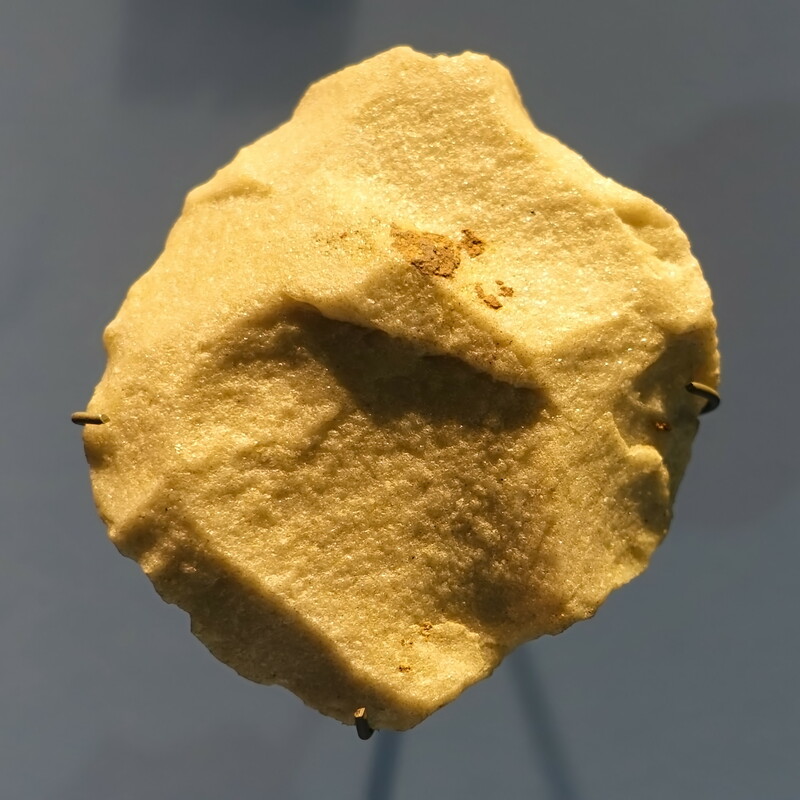 This particular facsimile demonstrates the way that 3D printing is revolutionising the way that good quality facsmiles of important finds can be sent around the world as a file, then recreated by a 3D printer, and coloured by a knowledgeable artist. 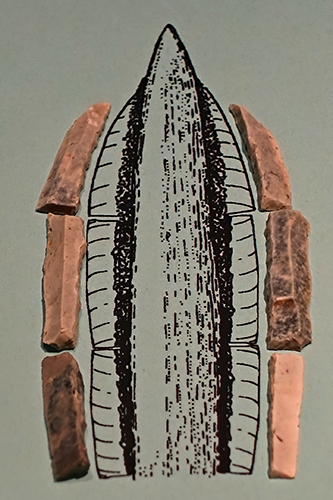 If the reader looks very carefully at the facsimile here by clicking on the small thumbnail image to get the full sized version, the layers of which the 3D model has been built up may be seen. 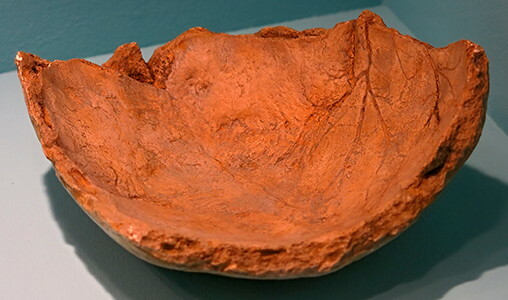 What remains to be done is the improvement of the technique to micrometre thick layers for large objects such as this, for greater fidelity to the original, and its dissemination at reasonable cost to institutions such as archaeology museums. 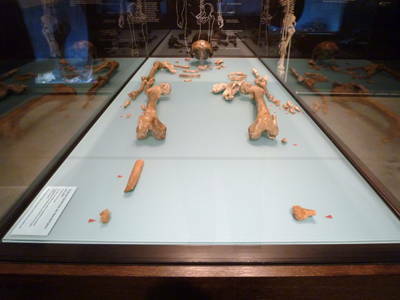 Source of the original at right: Original bones of the type specimen of Homo neanderthalensis, displayed at LVR-LandesMuseum Bonn. Source: Adapted from the book 'Wanderungen zur Neandershöhle - Eine topographische Skizze von Erkrath an der Düssel', published in 1835 Arnz & Comp. Verlag Düsseldorf. The book was launched in 1956 on the occasion of the 100th anniversary of the discovery of the Rhineland Regional Council in cooperation with the Nature Protection Society Neanderthal again. A facsimile is available under ISBN 3-92205-519-2 . The creator of the lithograph is not known, but it was probably one of the publishing houses or the self-appointed artist Bongard. This is a very important image of finds from the Neander Valley. 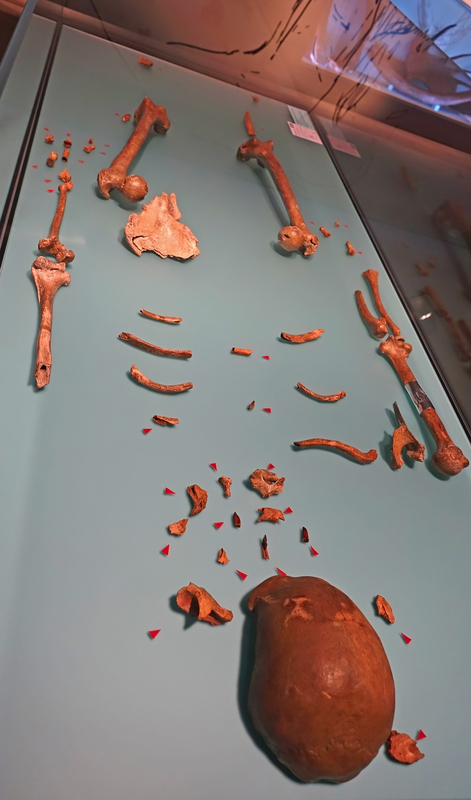 It shows a range of Neandertal and Gravettian artefacts, and the remains of three individuals different to the type specimen, discovered in 1997 - 2000. 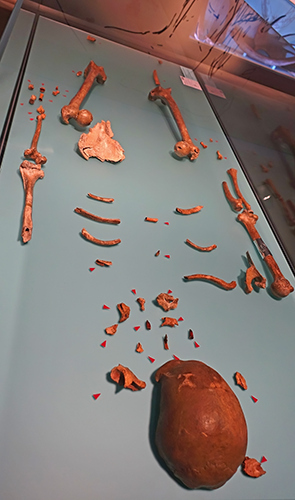 This image shows the human remains and artefacts from the 1997 - 2000 additional discoveries of both the type specimen of 'Vater', a male, as well as 'Mutter', a female, and an infant, 'Kind' (i.e. 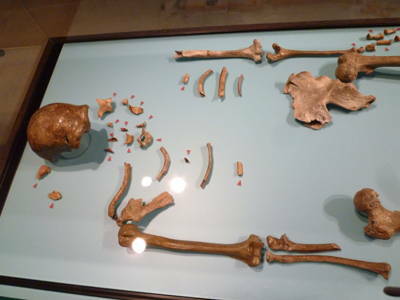 father, mother, and child) as well as artefacts from the Gravettian hunting encampment in the Feldhofer Kirche, a cave or abri immediately adjacent to the Kleine Feldhofer Grotte where the original Neandertal remains were found. More detailed images from this particular display board may be seen below. These are some of the remains of the additional male neanderthal, found during the 1997 - 2000 campaign. This image includes a few more pieces of the additional male neanderthal skeleton, found during the 1997 - 2000 campaign. 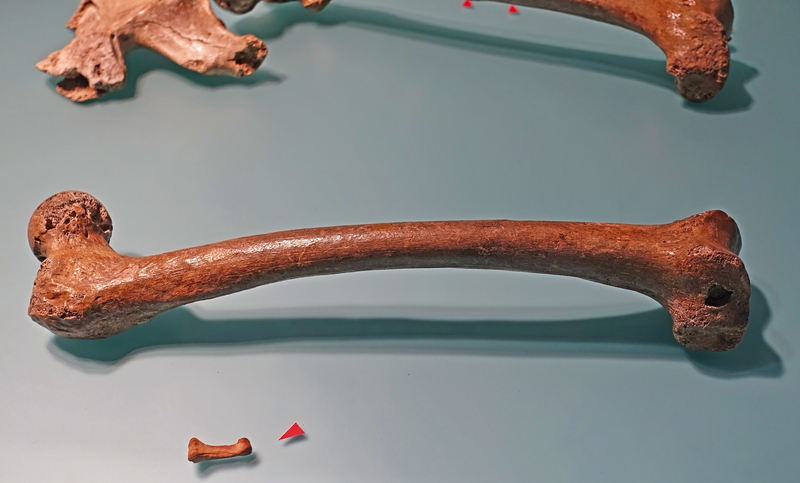 Skeletal remains of three more Neanderthals were found, from 42 000 BP, contemporaneous with the original Neanderthal, in the Kleiner Feldhofer Grotte during the 1997 - 2000 campaign. 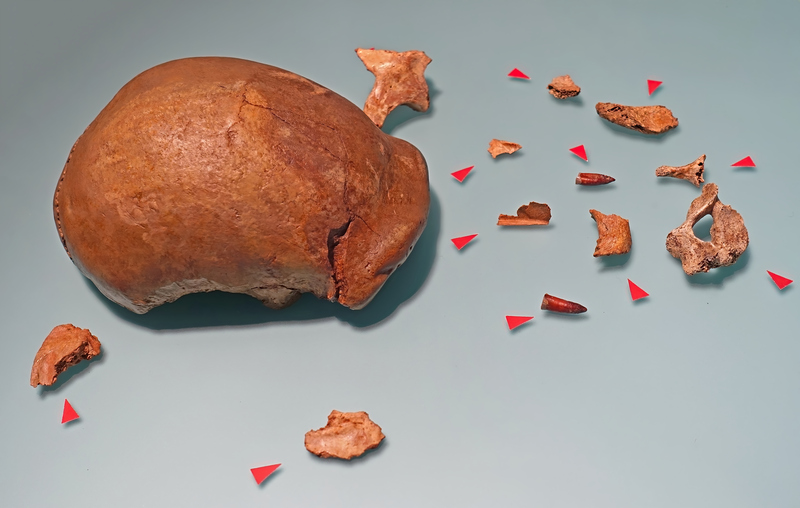 These two images show fragments of the right radius of an adult Neanderthal man from the Kleiner Feldhofer Grotte. These two images show fragments of the right ulna of an adult Neanderthal man from the Kleiner Feldhofer Grotte. These remains are from another neanderthal at the site, believed to be a woman, labelled 'Mutter' or 'Mother' on the display board. NN5 on the left is from the additional male Neanderthal. 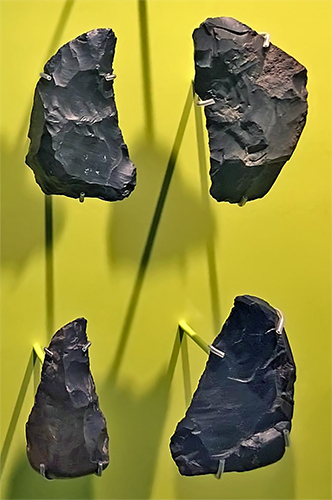 Tools made by Neanderthals, from the Neander valley, discovered in the 1997 and 2000 excavations. 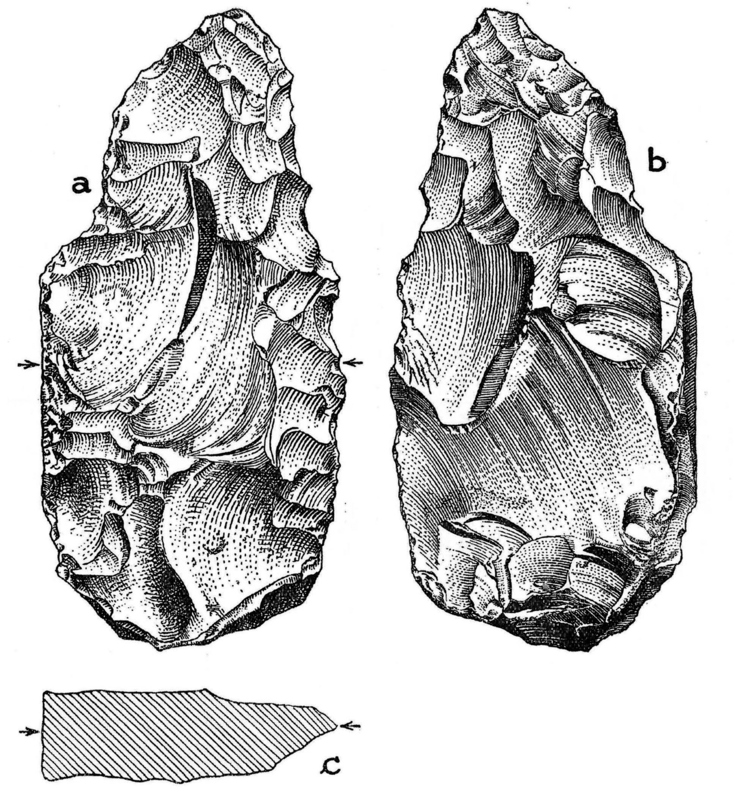 In addition to finding animal and human bones, archaeologists also located thousands of stone tools in the sediments of the two former neighbouring caves - Feldhofer Grotte (Neanderthal tools from circa 42 000 BP) and Feldhofer Kirche (Gravettian tools, from circa 25 000 BP) - during the 1997 and 2000 excavations. 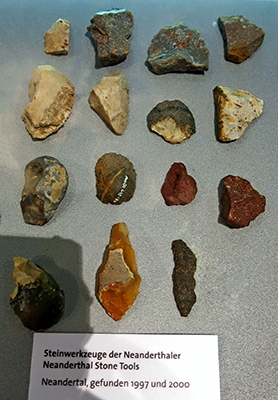 These are some of the Neanderthal tools. Gravettian tools from the Feldhofer Kirche, circa 25 000 BP. 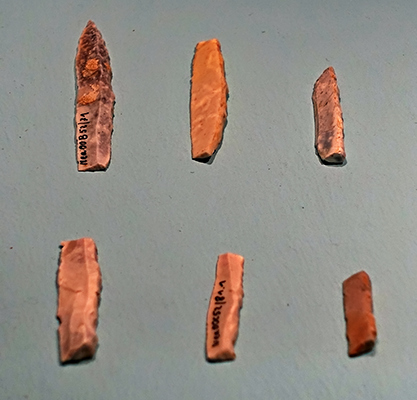 Tools made by Neanderthals, of the Micoquian/Keilmessergruppen culture, found in the clay from the Kleine Feldhofer Grotte, in the Neander valley, 42 000 BP, discovered in the 1997 and 2000 excavations. The tools shown here are small round scrapers of the Groszak type (coins), so called because of their shape and small size, and are made of chert, quartzite and quartz. 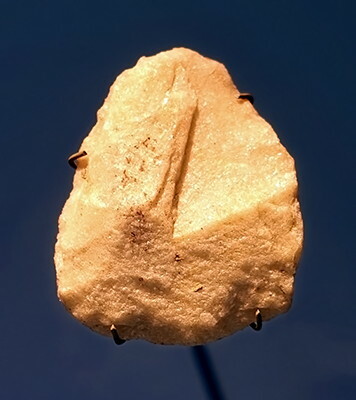 (right): Halbkeil or half wedge, variously used as a hafted hide scraper, knife or projectile point. 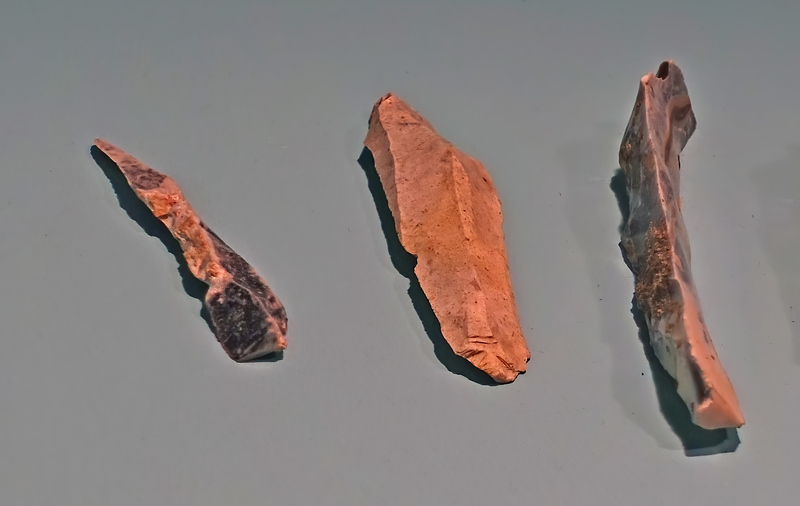 Scrapers made of quartzite, flint, and chert. Close ups of two of the scrapers above. 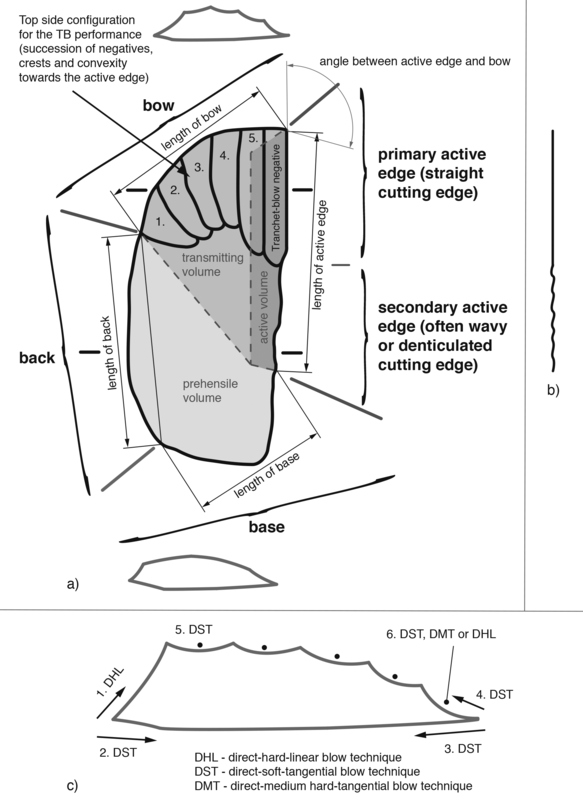 Keilmesser (wedge knives, with one sharp edge and one edge dulled) are asymmetrically (bifacially) backed knives with a lateral tranchet blow modification (see illustration of this modification below) on the cutting edge. This is a schematic illustration of a Keilmesser with tranchet blow. a) Partition of a KMTB into different volumes (active, transmitting and prehensile) showing measurement positions of active edge, bow, back and base, as well as cross sections; b) Lateral view of the active edge showing bipartition and c) General and subsequent reduction steps following alternating unifacial edge regularization (AUER) on a KMTB and detected techniques. Diagram showing the different steps of the lateral tranchet blow technical process (A), an example of a successful removal (B), and an accident (C). 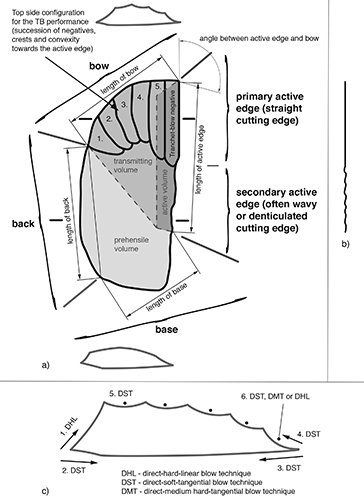 The result of this technical process is the creation of a smooth edge portion on the edge dihedral of the disto-lateral end of convergent tools. One of the two pieces that Jacob-Friesen (1949) published as Keilmesser (object is rotated for better illustration). Without scale. Flakes and a core, of quartzite. Source and text: Display at LVR-LandesMuseum Bonn. 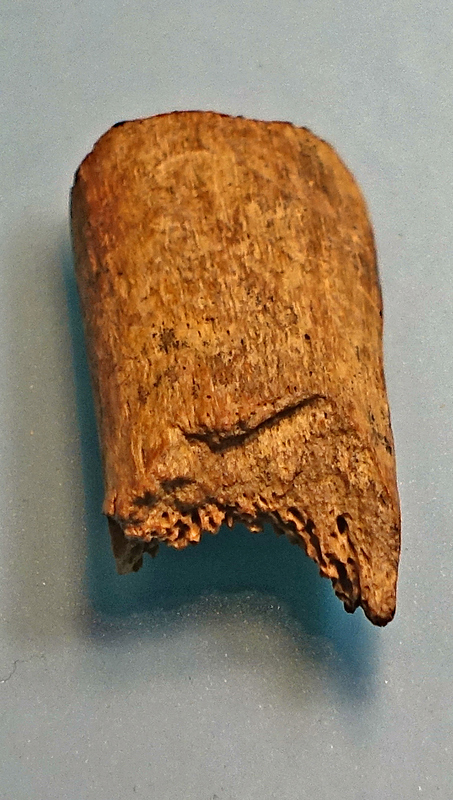 Mammoth rib. This shows that firstly there were mammoths there at the time, and secondly that the Neanderthals at least collected their bones, if not actually hunting them for their meat. 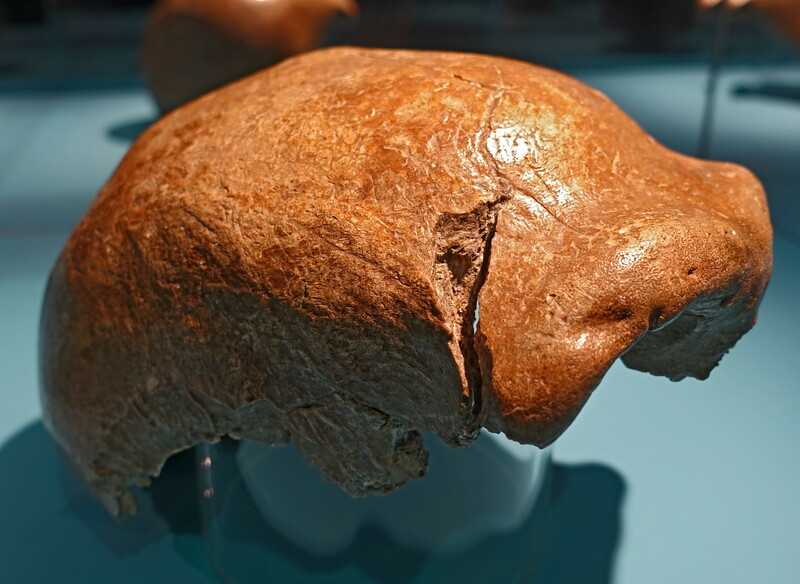 Skull fragment of an early Neanderthal. On loan from: Generaldirektion Kulturelles Erbe Rheinland-Pfalz. 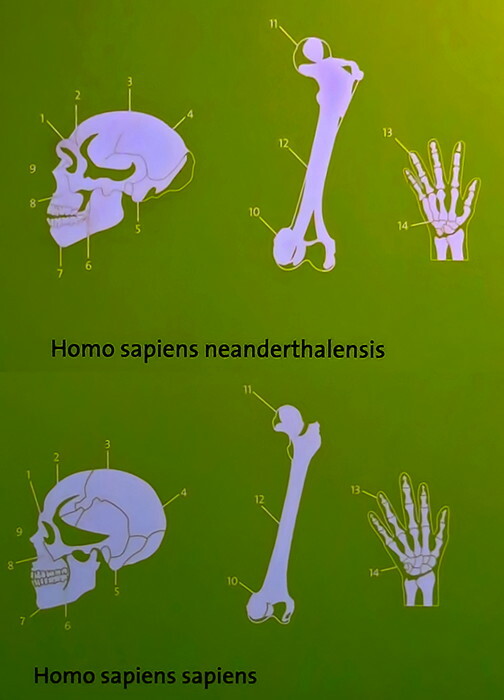 Neanderthals were very thick set and strong. Sculptor: Unknown, but possibly Atelier Élisabeth Daynès, Paris, for the Neanderthal Museum, 1996, or Kennis & Kennis Reconstructions, who have also done superb reproductions of Neanderthal subjects. 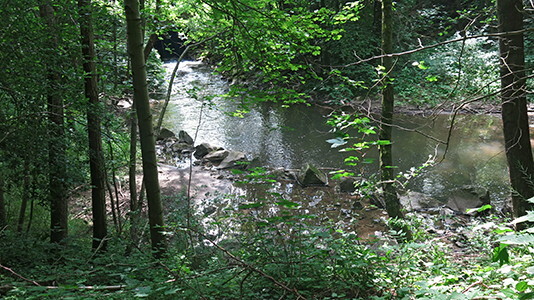 The Neandertal is a valley about 10 km east of Duesseldorf named after the 17th century poet Joachim Neander who liked this lovely valley very much. So, it became Neander's Tal. 'Tal' means 'valley' and one might note that the scientific name is (usually) written with 'th'. The reason is that around the year 1900 there was a reform of German orthography and many words written with 'th' like Thurm (tower), Thuere (door) lost their 'h'. Interestingly not the word Thron (= throne). The reason is that at that time Germany had an Emperor, William II, and he did not want to sit on a throne without 'h', so it remained in place by higher order. 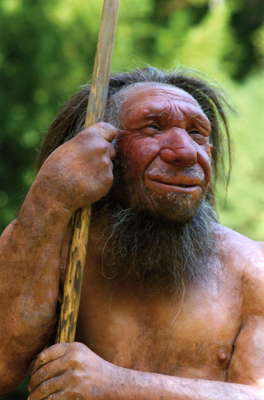 However, if you want to visit that site today and the nice museum there, you have to look for 'Neandertal' - without 'h'. 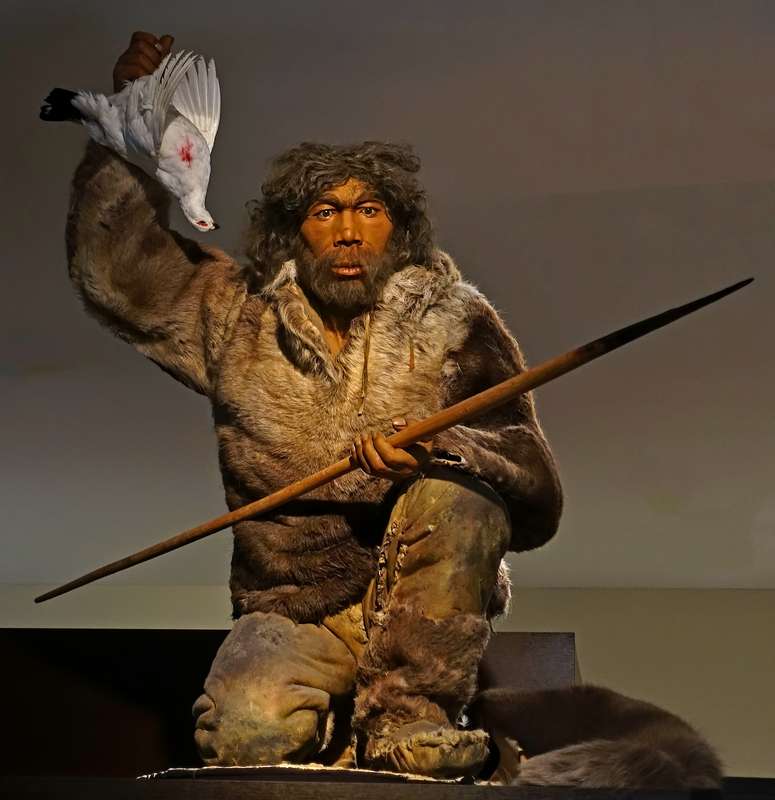 In 'neanderthal man' it remained by scientific consequence or tradition. The Neandertal in former times was a lovely valley with forests, meadows and a creek much loved by artist who came from the nearby Duesseldorf to paint the landscape-it was the romantic age of the 19th century. The name of the creek is 'Duessel' and consequently the name of the village at the junction of the creek with the Rhine was called Duesseldorf, no longer a 'Dorf' (= village) these days. 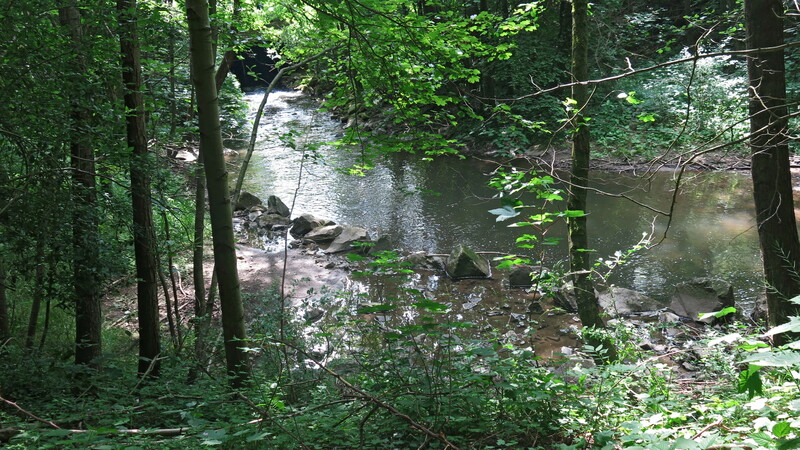 However, this area east of Duesseldorf is rich in limestone because there is a Devonian coral reef, 400 million years old, and the limestone was – and is – very popular in building trade, so there was a stone quarry. At a site called Kleine Feldhofer Grotte (cave) some quarry workers found weird bones and thought they might belong to a bear or – the Napoleon War was not long ago – they were bones of some rheumatic soldier of the beaten Napoleon army. 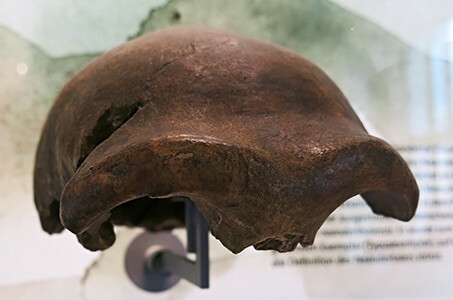 It was C. Fuhlrott, the local high school teacher who immediately realised the importance of the bones, the calotte (uppermost and thickest portion of the skull, which may persist as a bony remnant of the skull for the longest time) of a skull and some other bones. A street in Wuppertal is named after Fuhlrott. 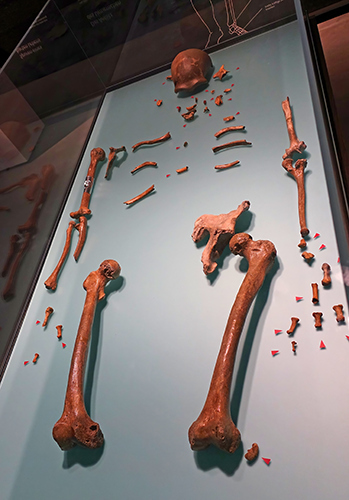 The bones were not found in situ – which means they were not found in their natural, undisturbed position, therefore, an exact dating of the remains is not yet accomplished. The age is assumed to be 40 000 to 100 000 years (neopleistocean, Weichsel-glacial). The huge limestone rock that housed the cave where the bones were found is long gone – completely gone. 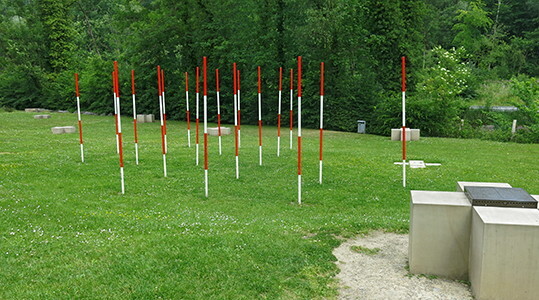 The original site is now a meadow with marks and information one can obtain from tables and earphone that can be borrowed at the near-by Neandertal Museum. 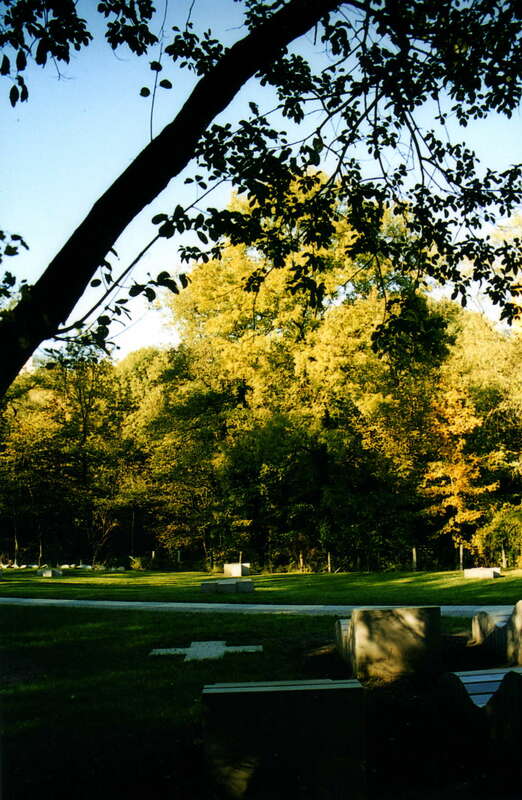 The photos show how the original site looks today. 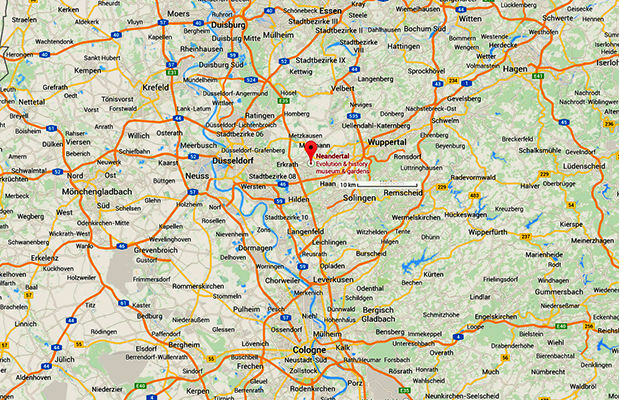 Geographical coordinates: 51°13'38.93'' North, 6°56'43.22'' East. Imagine a huge rock with the cave entrance about 20 metres high above the present ground level. So, the original site is really gone. The more surprising is it that a recent careful revision of the area (1998) resulted in the discovery of the (lost) original location and the identification of the sites that were called 'Kleine Feldhofer Grotte' and 'Feldhofer Kirche' early in the 19th century. 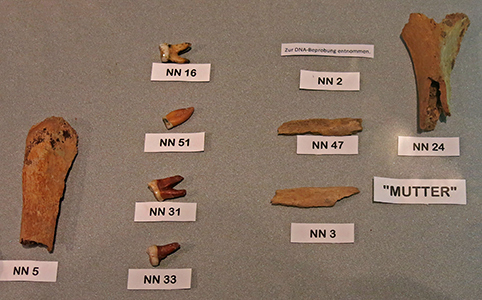 The two archeologists Juergen Tissen and Ralf Schmitz were even able to identify the rubble from these sites and detected some missing parts of the historical 1856 discovery: 20 parts including a molar, ribs, vertebrae, toe-bones. They even found a coin-sized bone splinter that fits exactly into the 1856 left knee joint. There is also hope that some new stone artefacts from the site will provide additional information about the age of the skeleton. The entrance gate to the original site (about 500 m west of the museum down the road). The entrance gate to the original Neanderthal site. The site itself was completely removed by quarrying for limestone. 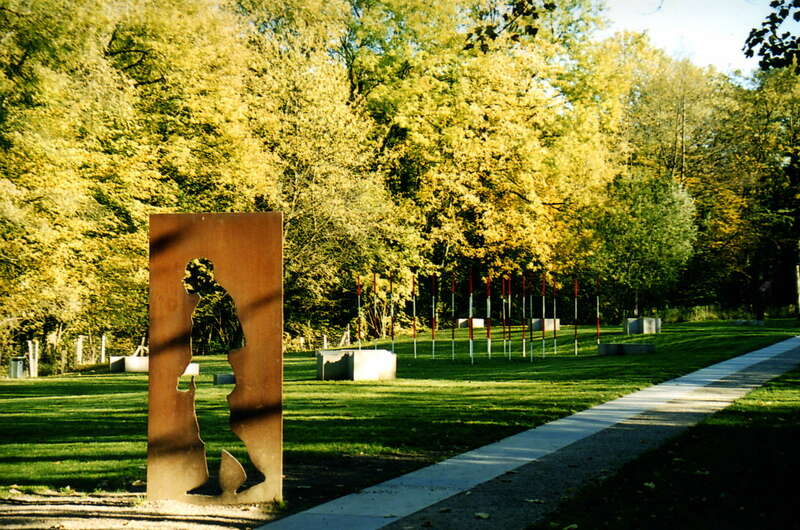 South-west view of the site coming from the entrance to the clearing. South-east view (opposite direction, towards the entrance). 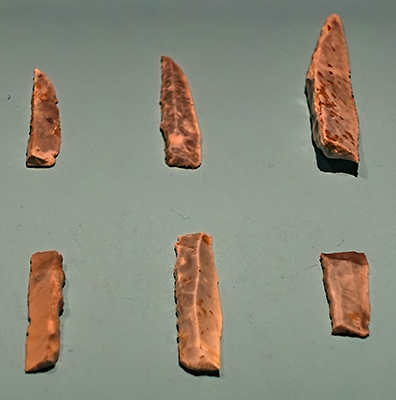 The original site was in the middle of the clearing where the stakes are. The concrete cross marks the spot where the cave used to be. The poles represent finds made. Nothing now remains of the limestone which once covered the area, and in which the original cave had been. Up river in the Düssel valley as it looks now, close to the museum not far from where a herd of Wisents are pastured. 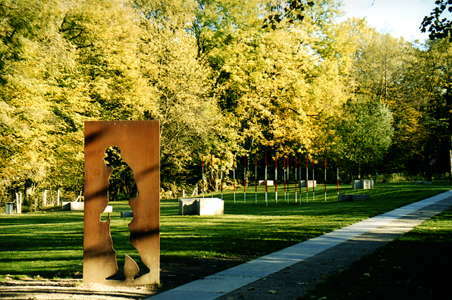 'walk through time' near the museum. 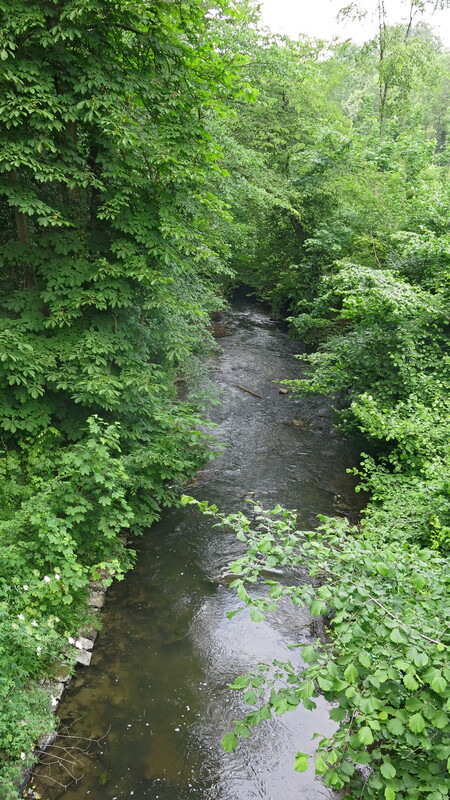 The Düssel, the river through the Neander Valley. 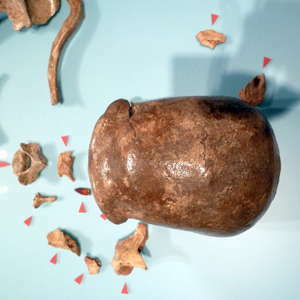 Although the Neander Tal is most famous for its Neanderthal, Middle Palaeolithic remains, Upper Palaeolithic remains were also found when the researchers fortuitously exposed the small cave of Feldhofer Kirche immediately adjacent to the Kleine Feldhofer Grotte which contained the Neanderthal remains. 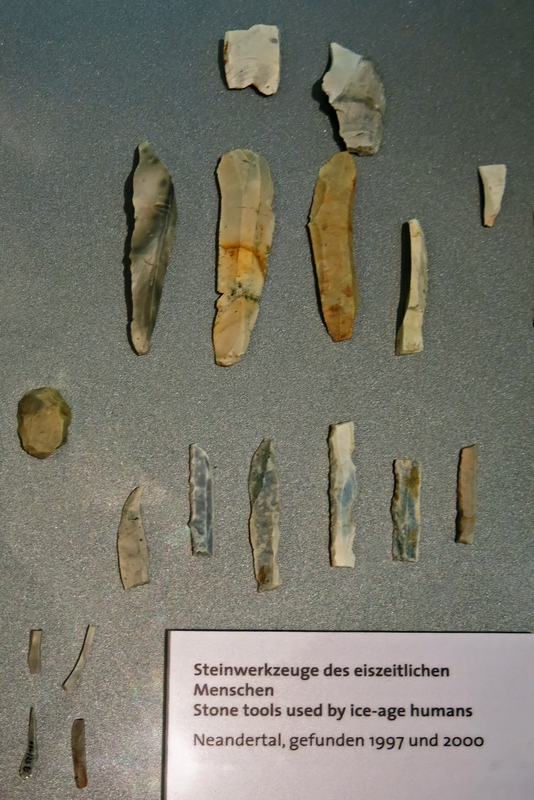 Finds from the loam of the cave 'Feldhofer Kirche' in the Neander valley included numerous parts of projectile tips which prove that it was a hunting camp. Several such camps supplied a main base camp with food or materials for the manufacture of stone tools during the Gravettian. 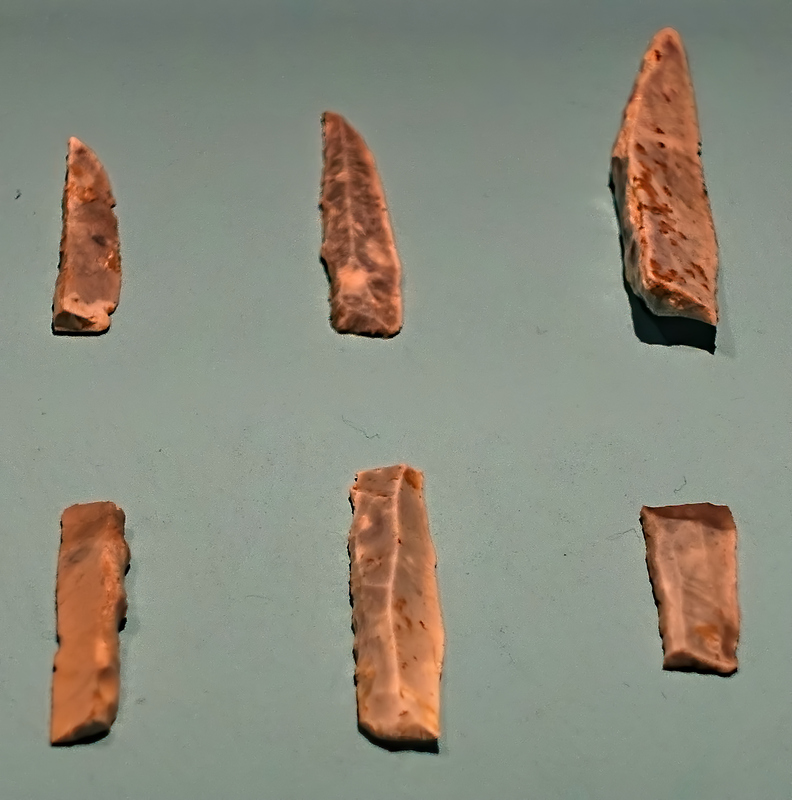 ( Microliths began to be made in the Gravettian, and were possibly used at that time in complex spear points as shown here, although microliths only became ubiquitous in the Magdalenian and later cultures. However this display has been created with the much bigger backed knives, in my opinion a most unlikely usage. Backed knives would have been difficult to insert in the inevitably narrow groove in the ivory or bone spear head, since they would have been too long and curved and uneven to insert easily into the groove, and too thick. 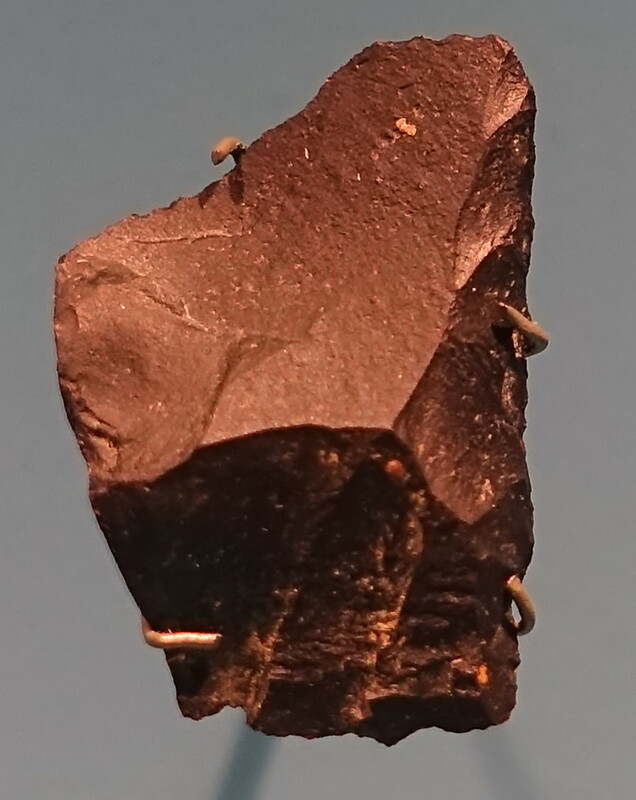 Burins of flint and dark radiolarite, a type of microcrystalline quartz. 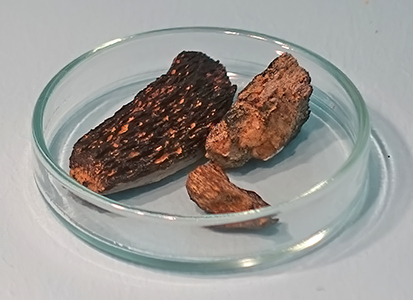 Charred bone from the Neanderthal (left) and Gravettian (right) deposits. Bone was used as a fuel in both the Neanderthal and the Gravettian deposits. Bone is not an ideal fuel. The fires would have been started with grasses and twigs, and the bone added once the fire was burning well. Even so, bone is probably best used as an adjunct to wood. A fire will continue to burn with 75% bone, Vaneeckhout et al. (2010), without air being forced onto the coals. 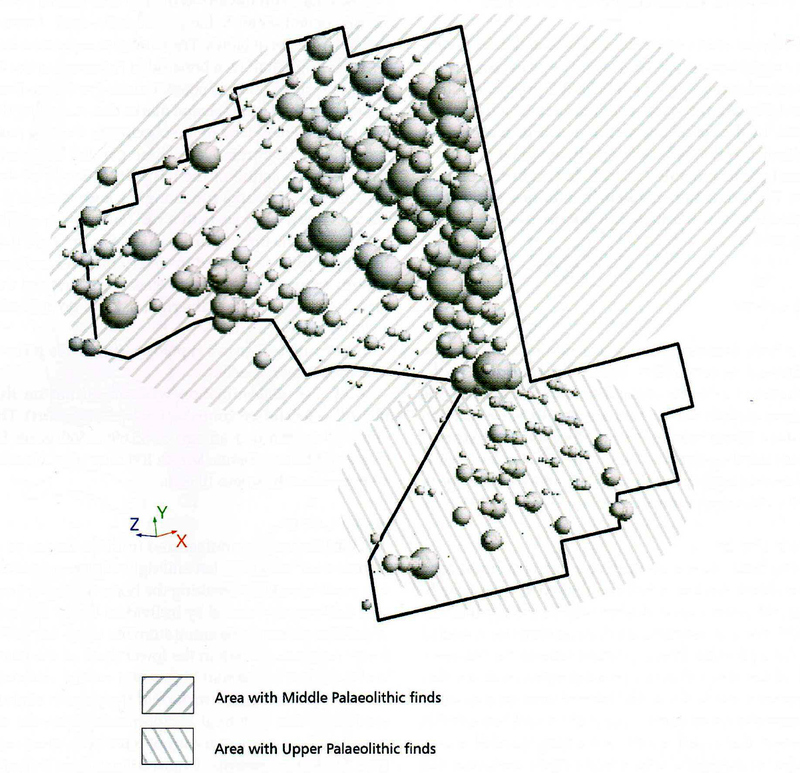 Jacob-Friesen, K., 1949: Die Altsteinzeitfunde aus dem Leinetal bei Hannover mit einem geologischen Beitrag von Dr. Fritz Hamm, Veröffentlichungen der urgeschichtlichen Sammlungen des Landesmuseums zu Hannover, vol 10. Lax, Holdesheim. 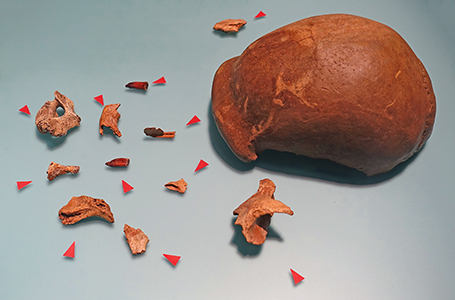 Schmitz, R. et al., 2002: The Neandertal type site revisited: interdisciplinary investigations of skeletal remains from the Neander Valley, Germany, Proceedings of the National Academy of Sciences of the United States of America, vol. 99,20 (2002): 13342-7. 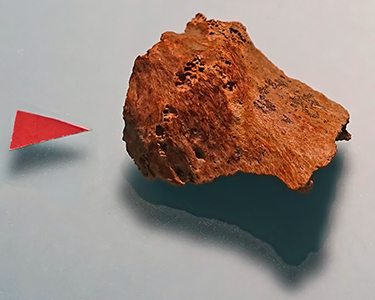 Vaneeckhout, S. et al., 2010: Prehistoric burned bone: use or refuse - results of a bone combustion experiment, Faravid, Vol. 34, p7-15. 9p. Voisin, J., 2004: Clavicule: approche architecturale de l’épaule et réflexions sur le statut systématique des néandertaliens, Comptes Rendus Palevol, 3, 133–142. Voisin, J., 2006a: Krapina and other Neanderthal clavicles: A peculiar morphology? Periodicum Biologorum, 108, 331–339.